Evidence is reviewed which supports the hypothesis that prokaryotes and eukaryotes may have colonized Mars. One source of Martian life, is Earth. A variety of species remain viable after long term exposure to the radiation intense environment of space, and may survive ejection from Earth following meteor strikes, ejection from the stratosphere and mesosphere via solar winds, and sterilization of Mars-bound spacecraft; whereas simulations studies have shown that prokaryotes, fungi and lichens survive in simulated Martian environments--findings which support the hypothesis life may have been repeatedly transferred from Earth to Mars. Four independent investigators have reported what appears to be fungi and lichens on the Martian surface, whereas a fifth investigator reported what may be cyanobacteria. In another study, a statistically significant majority of 70 experts, after examining Martian specimens photographed by NASA, identified and agreed fungi, basidiomycota ("puffballs"), and lichens may have colonized Mars. Fifteen specimens resembling and identified as "puffballs" were photographed emerging from the ground over a three day period. It is possible these latter specimens are hematite and what appears to be "growth" is due to a strong wind which uncovered these specimens--an explanation which cannot account for before and after photos of what appears to be masses of fungi growing atop and within the Mars rovers. Terrestrial hematite is in part fashioned and cemented together by prokaryotes and fungi, and thus Martian hematite may also be evidence of biology. Three independent research teams have identified sediments on Mars resembling stromatolites and outcroppings having micro meso and macro characteristics typical of terrestrial microbialites constructed by cyanobacteria. Quantitative morphological analysis determined these latter specimens are statistically and physically similar to terrestrial stromatolites. Reports of water, biological residue discovered in Martian meteor ALH84001, the seasonal waning and waxing of atmospheric and ground level Martian methane which on Earth is 90% due to biology and plant growth and decay, and results from the 1976 Mars Viking Labeled Release Experiments indicating biological activity, also support the hypothesis that Mars was, and is, a living planet. Nevertheless, much of the evidence remains circumstantial and unverified, and the possibility of life on Mars remains an open question. Presented here is a body of evidence and observations which do not prove but supports the hypothesis Mars was, and is, a living planet hosting prokaryotes, lichens, and fungi. This evidence includes: 1) Results from simulation studies demonstrating a variety of species can survive in a Mars-like environment (Cockell et al. 2005; Osman et al. 2008; Mahaney & Dohm, 2010; Pacelli et al. 2016; Sanchez et al. 2012; Schuerger et al., 2017; Selbman et al. 2015), particularly if shielded by soil and stone and provided water for which there is now evidence (Malin & Edgett 1999, 2000; Perron et al. 2007; Renno et al. 2009; Villanueva et al. 2015); 2) NASA's Mars Viking Labeled Release experiments (Klein et al. 1976; Levin & Straat 1976, 1979a,b, 2016) which detected evidence which met the criteria established by pre-mission field-tests for biological activity; 3) Observation of specimens which resemble fungi, "puffballs," algae and lichens (Dass 2017; Joseph 2014; Kupa 2017; Rabb 2015; Small 2015); 4) Seasonal waxing, waning, and continual replenishment of Martian methane (Formisano et al. 2004; Mumma et al. 2009; Webster et al. 2018) and which has no obvious purely geological source and 90% of which on Earth is due to biological activity including seasonal plant growth; 5) Observations of digitate silica structures that closely resemble complex sedimentary formations produced by a combination of abiotic and biotic processes (Ruffi & Farmer 2016) as well what appears to be microbial mats (stromatolites) which may have been built by water-dwelling cyanobacteria, possibly between 3.2 to 3.7 billion years ago (Bianciardi et al. 2014, 2015; Noffke 2015; Rizzo & Cantasano 2009, 2011, 2016); 6) Specimens identified as "hematite" which were likely produced in thermal ("hot") springs (NASA 2009; Squyres et al. 2004) and which, on Earth, have been cemented together, via water-dwelling prokaryotes and fungi (Ayupova et al 2016; Bosea et al. 2009; Claeys 2006; Fredrickson et al., 2008; Gralnick & Hau 2007; Owocki et al. 2916); 7) Detection of carbonates and polycyclic aromatic hydrocarbons in Martian meteorite ALH84001 which has been dated to 4 billion years ago and which were also generated in the presence of water (Clement et al. 1998; McKay et al. 2009; Thomas-Keprta et al. 2009). One obvious source of life on Mars would be Earth. It is probable that solar winds striking, ejecting and propelling microbe-laden dust and debris in the stratosphere and mesosphere, deep into space (cf Arrhenius, 1908), and microbes dwelling in rock ricocheted into space from Earth by meteor strikes, have repeatedly contaminated Mars and other planets (Davies, 2007; Fajardo-Cavazosa et al. 2007; Hara et al. 2010; Melosh 2003; Mileikowsky et al. 2000; Schulze‐Makuch, et al. 2005) and vice-versa. Space craft which landed or crashed on Mars may have also transferred life from Earth to Mars. For example, immediately after sterilization, between 300 to 540 distinct colonies (on average) consisting of millions of organisms, including fungi, vegetative microorganisms, Bacillus, and grampositive cocci (Staphylococcus spp. and Micrococcus spp.) and numerous microorganisms belonging to the genus Streptococcus and the Corynebacterium Brevibacterium group, were found per square meter on the outer surfaces of the Mars Vikings Landers and other space craft (La Duc et al. 2014; Venkateswaran et al. 2012; Puleo et al. 1977). As to species which were not or could not be cultured, and those masses of bacteria and fungi still growing within the interior of this equipment, the number of survivors is unknown. Bacillus not only survive dry heat sterilization but tolerate long duration exposure to the radiation intense environment of space (Horneck 1993; Nicholson et al. 2000; Vaishampayan et al. 2012) and in simulated Mars-like environments (Moeller et al. (2012). Various species of Micrococcus also escaped death by sterilization (Puleo et al. 1977) and survive in low Earth orbit, whereas various strains of staphylococcus and Corynebacterium, tolerate simulated space-like conditions (McLean & McLean 2010) and (Corynebacterium) simulated Martian environments (Nicholson et al. (2012) and, as noted, could not be eradicated from space craft. Streptococcus is yet another species which resisted NASA's sterilization attempts, and (although disputed) remained viable after direct exposure to space, including up to 30 months on the moon (Mitchell & Ellis, 1971). Hence, everything sent to Mars may have carried fungi and microorganisms as part of their cargo. Over 1,800 different types of bacteria as well as fungi and algae thrive and flourish within the troposphere, the first layer of Earth's atmosphere (Brodie et al. 2007). Air is an ideal transport mechanism and serves as a major pathway for the dispersal of bacteria, virus particles, algae, protozoa, lichens, and fungi including those which dwell in soil and water. Viable microorganisms and spores have been recovered at heights of 40 km (Soffen 1965), 61 km (Wainwright et al., 2010) and up to 77 km within the mesosphere (Imshenetsky, 1978). These include Mycobacterium, Micrococcus, and fungi Aspergillus niger, Circinella muscae, and Penicillium notatumm 77 km above Earth (Imshenetsky, 1978). In one study designed to disprove the possibility NASA might contaminate Mars, samples of Bacillus pumilus were launched via a high-altitude NASA balloon to an altitude of 31 km above sea level (Khodad et al. 2017). Nevertheless, a large number of Bacillus pumilus remained viable; and it only takes one bacterium to produce billions of bacterial offspring. Moreover, due to tropical storms, monsoons, and even seasonal upwellings of columns of air (Randel et al., 1998), microbes, spores, fungi, (along with water, methane, and other gases) may be transported to the stratosphere and mesosphere where they may remain viable (Imshenetsky, 1978; Soffen 1965; Wainwright et al., 2010). As first formally proposed by Nobel Laureate Dr. Svante Arrhenius (1908) solar winds and photons could disperse space-borne organisms throughout the cosmos. Hence, it can be readily assumed that microbes not only flourish in the troposphere, but when lofted into the stratosphere and mesosphere many remain viable and may then be blown into space by powerful solar winds (Arrhenius 1908; Joseph & Schild, 2010) where, as shown experimentally, they can easily survive (Horneck, et al. 1994, 2002, Nicholson et al. 2000; Novikova et al. 2016; Onofri et al. 2012; Raggio et al. 2011; Sancho et al. 2007; Setlow 2006). For example, between September 22-25, 1998, and as detected and measured by NASA's Ultraviolet Imager aboard the Polar spacecraft, a series of coronal mass ejections (CME) and a powerful solar wind created a shock wave which struck the magnetosphere and the polar regions with sufficient force to cause oxygen, helium, hydrogen, and other gases (Moore & Horwitz, 1998), as well as water molecules and surface dust (Schroder & Smith, 2008), to gush from Earth's upper atmosphere into space. Normally the pressure is around two or three nanopascals. However, when the CME struck on September 24, 1998, the pressure jumped to ten nanopascals. Such events may have occurred repeatedly throughout Earth's history. Thus, it could be predicted that some airborne microbes, fungi, lichens, and algae, as well as water and dust, have been repeatedly lofted into the upper atmosphere; that a significant number remained viable, and were then swept into space and propelled by solar winds throughout the solar system (Arrhenius 1908); some of which may have landed on Mars only to go forth and multiply. Although innumerable meteorites disintegrate upon striking Earth's upper atmosphere, those at least ten kilometers across will punch a hole in the atmosphere and continue their descent (Van Den Bergh, 1989). When meteors this size or larger strike the surface, tons of dust, rocks, and other debris may be propelled over 100 km above the planet (Covey et al. 1994; Hara et al. 2010) and ejected into space, some possibly passing through that atmospheric hole before air can rush back in to completely fill the gap (Van Den Bergh, 1989). Asteroids and meteors striking Earth may have repeatedly sheared away masses of earth and rock, and blasted this material (and presumably any adhering microbes, fungi, algae, and lichens) into space (Davies, 2007; Fajardo-Cavazosa et al. 2007; Hara et al. 2010; Melosh 2003; Schulze‐Makuch, et al. 2005), where they can easily survive (Horneck, et al. 2002, Mclean & McLean, 2010; Nicholson et al. 2000; Novikova 2009; Onofri et al. 2012; Raggio et al. 2011; Sancho et al. 2007; Setlow 2006). Some of this microbe-laden debris may have later crashed on Mars (Davies, 2007; Fajardo-Cavazosa et al. 2007; Hara et al. 2010; Schulze‐Makuch, et al. 2005) where, as demonstrated by simulation studies, a variety of organisms can also survive (Cockell et al. 2005; Osman et al. 2008; Mahaney & Dohm, 2010; Pacelli et al. 2016; Sanchez et al. 2012; Selbman et al. 2015). Experiments have shown that microbes can resist the shock of a violent impact casting them into space (Mastrapaa et al. 2001; Burchell et al. 2001, 2004). Further, a substantial number could easily survive the descent to the surface of a planet (Burchell et al. 2001; Horneck et al. 2002; McLean & McLean 2010), even following high atmospheric explosions, i.e. the Columbia space shuttle explosion (Szewczyk et al., 2005), and despite reentry speeds of up 9700 km h-1 (McLean et al., 2006). When meteors strike Earth's atmosphere, they are subjected to extremely high temperatures for only a few seconds. If of sufficient size, the interior of the meteor will stay relatively cool, with the surface material acting as a heat shield. Heat does not affect the material uniformly. The interior may never be heated above 100°C whereas spores can survive post shock temperatures of over 250°C (Burchell et al. 2004; Horneck et al. 2002). Mars has a very thin atmosphere. Thus, many species of microbe have evolved the ability to survive a violent hypervelocity impact and extreme acceleration and ejection into space, including extreme shock pressures of 100 GPa; the frigid temperatures and vacuum of an interstellar environment; the UV rays, cosmic rays, gamma rays, and ionizing radiation they would encounter; and the descent through the atmosphere and the crash landing onto the surface of a planet. Certainly, surviving organisms dwelling within ejecta from Earth might land on Mars (Davies, 2007; Fajardo-Cavazosa et al. 2007; Hara et al. 2010; Melosh 2003; Mileikowsky et al. 2000; Schulze‐Makuch, et al. 2005). And those which can adapt, would likely go forth and multiply. Numerous investigators have found that a variety of species, including bacteria, algae, fungi and lichens, can survive a simulated Mars-like environment, and that survival rates dramatically increase if provided water or shielded by rock, sand, or soil (Cockell et al. 2005; Osman et al. 2008; Mahaney & Dohm, 2010; Pacelli et al. 2016; Sanchez et al. 2012; Selbman et al. 2015; Villanueva et al. 2015). These simulated environments have included those which imitate Martian radiation, temperature extremes and variations, the low surface pressures, atmospheric gas pressures, the distance between Mars and the sun, the Martian summer/winter solstices and spring/fall equinoxes, environmental parameters analogues to the 24 hours 39 minutes circadian cycle of the Red Planet, effects of shielding and aqueous vs desert vs arctic vs subsurface conditions, and in a CO2-enriched anoxic atmosphere. For example, Moeller et al. (2012) found that spores of Bacillus subtilis survived simulated Martian atmospheric and UV irradiation conditions, whereas de Vera and colleagues (2014) reported that cyanobacteria collected from cold and hot deserts survived "Mars-like conditions such as atmospheric composition, pressure, variable humidity (saturated and dry conditions) and strong UV irradiation." Nicholson et al. (2012) reported that six subspecies of the genus Carnobacterium collected from a permafrost borehole in northeastern Siberia--considered to be analogs of the subsurface environment of Mars--and nine additional species of Carnobacterium were all capable of flourishing and growing under Mars-like conditions. In yet another study, four methanogen species (Methanosarcina barkeri, Methanococcus maripaludis, Methanothermobacter wolfeii, Methanobacterium formicicum) survived exposure to low pressure conditions similar to Martian surface pressure (Tarasashvili et al., 2013). Cyanobacteria also tolerate Mars-like conditions (de Vera et al. 2014). Olsson-Francis and colleagues (2009) exposed akinetes (dormant cells formed by filamentous cyanobacteria) to extraterrestrial conditions, including periods of desiccation, temperature extremes (-80 to 80°C), and UV radiation (325-400 nm), and which displayed high levels of viability in these environments similar to Mars. Eukaryotes (fungi, lichens) are also survivors (Armstrong 2017; de Vera 2012; Sanchez et al. 2012; Zakharova et al. 2014). Zakharova et al. (2014) report that microcolonial fungi, Knufia perforans and Cryomyces antarcticus, as well as Exophiala jeanselmei (a species of black yeasts), not only survived but adapted and showed no evidence of stress after long term exposure to thermo-physical Mars-like conditions. Likewise, Onofri et al. (2018), after growing dried colonies of the Antarctic cryptoendolithic black fungus Cryomyces antarcticus and exposing them for 16 months to simulated Mars-like conditions on the International Space Station, found that "C. antarcticus was able to tolerate the combined stress of different extraterrestrial substrates, space, and simulated Mars-like conditions in terms of survival, DNA, and ultrastructural stability." Lichens are a symbiotic organism which have been classified as both a prokaryote and eukaryote and are comprised of cyanobacteria and fungi or a eukaryotic algae and fungus (Armstrong 2017; Brodo et al. 2001; Tehler & Wedin, 2008)--species which remain viable when exposed to Mars-like stimulated environments (Olsson-Francis et al 2009; Zakharova et al. 2014). Likewise, lichens easily survive environmental extremes, lack of water, desiccation, temperatures as low as -196°C (Armstrong 2017; Becket et al. 2009), as well as high levels of UV radiation and direct exposure to the radiation intense environment of space (Raggio et al. 2011; Sancho, et al. 2007). Hence, perhaps not surprisingly, studies have demonstrated that lichens remain viable and maintain photosynthetic activity when exposed to simulated Martian temperatures, atmosphere, humidity, and UV radiation (de Vera 2012; De la Torre Noetzel, 2017; Sanchez et al. 2012). For example, De la Torre Noetzel et al. (2017) exposed lichens to real space outside the ISS and to a Mars simulated environment for 18 months. The samples remained viable and these investigators reported normal metabolic activity of those exposed to the Mars-like environment. Simulation studies performed by numerous teams of independent investigators have thus demonstrated that a variety of prokaryotes and eukaryotes, including cyanobacteria, methanogens, fungi and lichens, could survive and even flourish on Mars, especially if dwelling beneath the soil or rock shelters and provided water--for which there is now evidence (Malin & Edgett 1999, 2000; Perron et al. 2007; Renno et al. 2009; Villanueva et al. 2015). Although controversial, the results from NASA's Mars Viking Labeled Release experiments also suggests that prokaryotes and simple eukaryotes not only survive on Mars but are engaging in biological activity (Klein et al. 1976; Levin & Straat 1976, 2016). Martian ground level radiation has been estimated to equal "0.67 millisieverts per day" (Hassler et al. 2013). This is significantly and profoundly below the radiation tolerance levels of a variety of prokaryotes (Moseley & Mattingly 1971; Ito et al. 1983) and simple eukaryotes, including fungi which can withstand radiation doses up to 1.7×104 Gy (Saleh et al. 1988). Moreover, fungi, lichens and numerous species of microbe are attracted to and thrive in highly radioactive environments (Becket et al. 2008; Dadachova et al. 2007; Tugay et al. 2006; Wember & Zhdanova 2001), even in space. Novikova et al. (2016; Novikova 2009) and Vesper et al. (2008) reported that fungi are invigorated and grow rapidly within the International Space Station as a consequence of the heightened radiation levels. These space-fungi are also impossible to eradicate. Moreover, fungi flourish on the outskirts and along the walls of the damaged and highly radioactive Chernobyl nuclear power plant (Dighton et al. 2008; Zhdanova et al. 2004). Fungi, lichens, and prokaryotes also survive long-term direct exposure to space, gamma, and solar UV radiation and remain viable (Horneck et al. 2002; McLean & McLean 2010; Nicholson et al. 2000; Novikova et al 2016; Onofri et al. 2012; Sato et al. 2011; Tugay et al. 2006; Sancho et al. 2007; Raggio et al. 2011). Moreover, fungi (Wember & Zhdanova 2001; Zhdanova et al. 2004) and radiation-tolerant bacteria (Moseley and Mattingly 1971; Ito et al. 1983) will seek out and grow towards sources of radiation which serve as an energy source for metabolism (Dighton et al. 2008; Tugay et al. 2006). Even if their DNA is damaged by radiation levels above their tolerance levels, they can easily repair these genes due to a redundancy of genes with repair functions (White et al. 1999). These and other species may also develop adaptive features--a property described as "radiostimulation," "radiation hormesis," and "adiotropism" (Levin 2003; Tugay et al. 2006; Zhdanova et al 2004)--and which also occurs in animals and plants living with increasing levels of background radiation (Adey 1993; Alshits et al 1981; Calabrese & Baldwin 1999, 2000; Zhuravskaya et al 1995). These radiation-induced adaptations include tissue and cellular regeneration and growth (Basset 1993; Becker 1984; Becker & Sparado 1972; Occhipinti et al. 2014; Levin 2003; Maffei 2014; Moment, 1949). Tugay and colleagues (2006; Zhdanova et al. 1991, 2004) exposed micro-fungi and fungi to pure or mixed radiation (137 Cs, 123 Te, 109 Cd, 121 Sn), gamma irradiation (121 Sn) 200-400 Gy, and mixed gamma and beta radiation (137 Cs) (100-150 Gy (equivalent to an electron dose of 300-500 Gy), and found that 60% of fungal strains exhibited positive radiotropism, significant growth, and enhanced spoor production. The varying levels of radiation on Mars would not be a hinderance to fungi, lichens, and numerous other species. 7. Evidence of Lichens and Fungi on Mars? Four independent investigators, after examining photos taken by NASA's Mars Rovers Opportunity and Curiosity, have observed hundreds of specimens resembling fungi, mushrooms, and lichens on the surface (Dass 2017; Joseph 2014; Rabb 2018; Small 2015). In 2016, Joseph devised a computerized system coded and programmed to quantify, validate, and statistically analyze expert judgments and developed a research-study website which was quantitatively coded and programmed to enable experts to link their computers to that website and examine and rate 25 separate photos of Martian specimens, type in the names of the specimens, and determine the probability these are living organisms. This methodology has been demonstrated to yield scientifically valid and reliable results (Dommeyer et al. 2004; Hewson & Stewart, 2016; Richardson 2005; Watt et al. 2002). The study website was also programmed to link all 25 ratings and responses of each individual expert, to that expert's computer IP address. Next, Joseph and his research assistants searched the faculty rosters of every university in the English-speaking world and located over 1000 scientists who had been identified by their universities as experts in fungi, algae and lichens, and over 1000 experts identified as experts in geomorphology and mineralogy, all of whom were invited to participate. Therefore, the "life on Mars" study was based on the judgments of two homogeneous "closed populations" of exerts in subfields of biology and geology (Joseph 2016). Samples from "closed populations" have a high degree of reliability and validity and accurately represent the views of other scientists belonging to those homogenous populations (Dommeyer et al. 2004; Hewson & Stewart, 2016; Richardson 2005; Watt et al. 2002). 1 (0% Probability) - 2 (33% Probability) - 3 (66% Probability) - 4 (100% Probability). Each of the participants were informed these specimens were photographed on Mars. Examination of the raw data indicated geologists and biologists agreed on five of their top seven choices and this data was analyzed. Chi-square analyses indicated a significant difference between scientists choosing "1" vs "2" but no difference between those choosing "2" vs "3" and "4," meaning that a significant majority of experts believe there is a high probability these are living organisms. A Fisher's exact statistical test was performed and demonstrated that a majority geologists and biologists agreed there is a high probability (vs no probability) of life on Mars, as based on the comparisons of the top five specimens chosen by biologists (p = <0.0008) and geologists (p = <0.0004); and the same is true of the top seven specimens, biologists (p = <0.0001) and geologists (p = <0.0001). Dozens of experts also identified these specimens as "puff balls," "Basidiomycota," "mushrooms," and "lichens." Therefore, a statistically significant majority of experts agree there is a high probability fungi and lichens may have colonized the Red Planet (Joseph 2016). Similarity in morphology, however, is not proof. 8. Evidence of Lichens on Mars? Lichens are composite life forms comprised and consisting of a symbiotic relationship involving algae/cyanobacteria (photobiont) and fungi (mycobiont), the latter of which is largely responsible for the lichens' thallus, mushroom shape, and fruiting bodies (Armstrong 2017; Brodo et al. 2001). The specimens observed on Mars and identified by experts as lichens (Dass 2017; Joseph 2016) closely resemble Dibaeis baeomyces, a fruticose lichen belonging to the Icmadophilaceae family--characterized by stalks which may grow to 6 mm topped by a bulbous apothecia, 1-4 mm in diameter and a crustose granular thallus attached to a substrate (Brodo, et al. 2001; Seminara et al. 2018). Dibaeis baeomyces have been found growing on rocks, in desert sand, dry clay, and in the arctic (Brodo et al. 2001; Jonsson et al. 2008; Platt & Spatafora 2000; Ryan et al. 2002; U.S. Department of the Interior 2010). The Martian specimens depicted in Figures 1 and 2 resemble Dibaeis baeomyces in morphology, shape, growth patterns, and size. All were photographed by Opportunity's Panoramic Camera, which, according to NASA's website, has a 1024 x 1024 pixel array and the following specs: The camera's "right eye" specializes in infrared wavelengths and the "left eye" in visible colors, thereby enabling NASA to colorize images. Both "eyes" are mounted at a height of about five feet (1.5 meters), with 11.8 inches (30 centimeters) between them. Image resolution is ~0.04 inch (1 millimeter) per pixel at a distance of 9.8 feet (3 meters), whereas focal length is capable of close ups at ~1.5 inches (39 millimeters), with optimal focus from five feet (1.5 meters). Unfortunately, NASA does not provide any specifications as to the exact distance from the camera, or the precise size of the images. Hence, the estimated size of specimens is based on bore hole size and pixel dimension. According to parameters provided by NASA, drill holes are 45 mm in diameter, five mm deep. Based on drill hole comparative parameters, specimens resembling lichens are approximately two mm to seven mm in size/length. Therefore, the Opportunity images of what appear to be lichens (Figures 1, 2) are similar to terrestrial lichens (Dibaeis baeomyces) in growth patterns, morphology, and size. By contrast, these specimens (Figures 1, 2) have little resemblance to terrestrial hematite (Figure 4), NASA's (2007) favored hypothesis. Hematite does not have a thallus or a fruiting-body mushroom shape, or a stalk/stem attached to rocks, or jut-out from rocks at varying angles. These are characteristics of lichens (Figure 3), not hematite (Figure 4). These observations support the Martian-lichens-hypothesis. Figure 1. Sol 88, photographed by Opportunity's "left" Panoramic Camera "eye." A significant majority of experts in fungi, lichens, geomorphology, and minerology agreed these may be lichens (Joseph 2016). These lichen-like specimens are estimated to be approximately 2 mm to 6 mm in size/length (based on bore hole specs) and are similar to terrestrial lichens (see text for details). Although there is no known geological process which commonly produces mushroom shaped rocks with stems, it is unknown if these are in fact living organisms. Similarities in morphology are not proof. Figure 2. Sol 37, photographed by Opportunity's "left" Panoramic "eye." A majority of experts agreed these may be lichens (Joseph 2016). The average size of these lichen-like specimens are estimated to be 2 mm to 7 mm, and are similar to terrestrial lichens (see Figure 3). However, if these are living organisms, or unusual sediments fashioned by the alien environment of Mars is unknown. Figure 3. Terrestrial Lichens / Dibaeis baeomyces. Ranging from 2 mm to 6 mm in size. Photos reproduced by permission: Courtesy of Dragisa Savic (left) and Stephen and Sylvia Sharnoff (right). Figure 4. 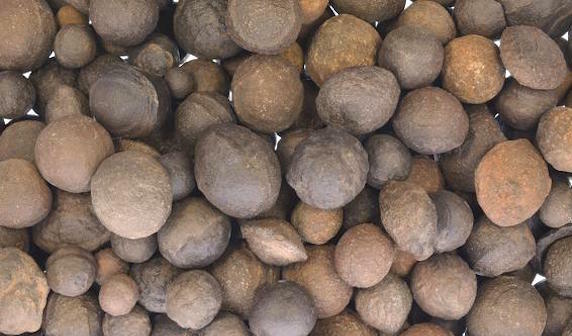 Hematite concretions the size of "pebbles" "marbles" and "golf balls" (the largest five cm) from Utah's national parks. Reproduced with permission, courtesy of Fantasia Mining and Ashley Rouech. 9. Evidence of Fungi on Mars? Lichens are comprised of algae and fungi, and four different investigators (Dass 2017; Joseph 2014; Rabb 2015, 2018; Small 2015) and a significant majority of experts in fungi, lichens, geomorphology, and mineralogy (Joseph 2016) have identified what appears to be fungi on the Martian surface and beneath Martian rock shelters (Figures 5, 6, 13). Fifteen specimens were photographed by the Rover Opportunity increasing in size and emerging from the ground over a three day period (Figure 8). Puffballs (phylum Basidiomycota) are round-shaped fruiting bodies that contain trillions of spores which are released as dry powdery "puffs" and which can resemble flakes of dry paint. They sit directly on and are usually attached by short stalks to the ground (Petersen 2013; Roberts & Evans 2011). Thus, the specimens in Figure 5 and 6 resemble puffballs (Figure 7). 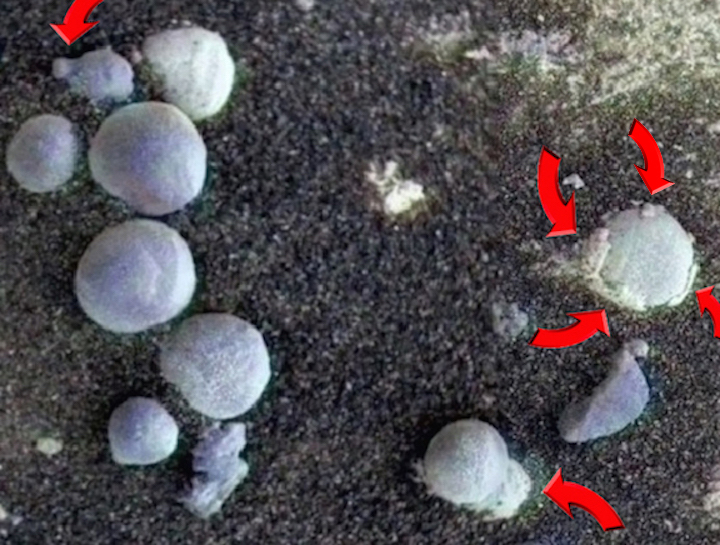 What appears to be spores may be littering the surrounding Martian surface (Figure 6). 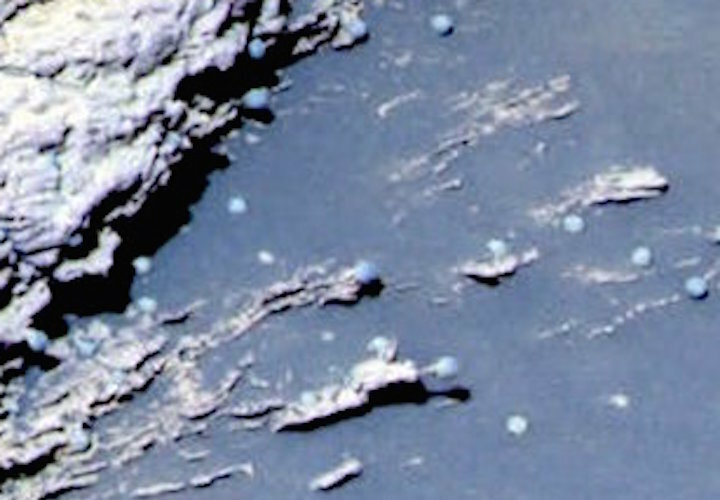 By contrast, NASA's favored hypothesis is these specimens are hematite produced in hot-springs (NASA 2009; Squyres et al. 2004). Figure 5. Sol 257 photographed by NASA's Mars Rover Opportunity. 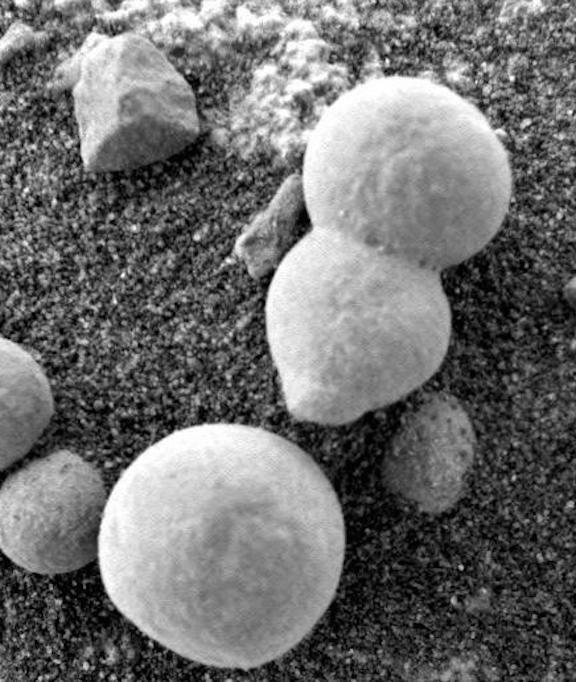 Martian specimens resembling Puffballs (Basidiomycota), some with stalks and shedding what appears to be spores and the outer cap, lower cup, and universal veil that covers embryonic fungi. To speculate further, the thick coats of white material being shed from the sides of some specimens may consist of crustose, and the white powder-spore-like material may consist of leprose. It is impossible, however, to determine with a high level of confidence if these are in fact living organisms. Similarities in morphology do not constitute proof. Figure 6. Sol 182 photographed by NASA Rover Opportunity. A majority of experts identified these specimens as "fungi" and "puffballs" (Joseph 2016). Note what appears to be spores littering the surface. NASA favors a hematite hypothesis. These specimens, however, also resemble hematite. Figure 7. Comparing terrestrial fungi (left) with Martian specimens (right, Sol 221 photographed by the Rover Opportunity at Meridian Planum, Mars). Credits: terrestrial puffballs, photo reproduced from myko.cz, Czech Mycological Society. Specimens depicted in Figures 5 and 6 were photographed by the "microscopic imager" attached to the rover Opportunity. According to specs provided on NASA's website, the microscopic imager has a focal length ranging from 0.8 inch (21 millimeters) an optimal focus distance of 2.67 inches (68 millimeters) and can resolve features as small at 0.004 inches (0.1 mm). The original image's size of Figures 6 and 7 was 1024 x 1024 pixels (0.001 inch or 0.031 millimeter per pixel). Based on these stats, the estimated size of the specimens in Figures 5 and 6 range from 1 mm to 50 mm (1 cm to 5 cm). Mature terrestrial puffballs, on average, are approximately 4.267 cm in size (Petersen 2013; Roberts & Evans 2011). In size and morphology several of these specimens resemble puffballs (Joseph 2016). The specimens depicted in Figures 5, 6, 8, also clearly resemble spherical hematite (Figure 4) in size, shape, morphology. However, hematite does consist of and does not shed sheaths of what appears to be a thick veil of material coating its outer-surface. Then there is the white fluffy-powdery spore-like material which appears to litter the ground. If not biological, perhaps these thick flakes and powdery substances are clumps of minerals, patina or salt and products of a sedimentological process in reaction to water or the Martian atmosphere that adhered to the contours of Martian hematite and surface features. Evidence favoring the fungal/puffball hypothesis is what appears to be the growth and emergence of 15 specimens, over a three day period (Figure 8). Specifically, five appear to increase in size whereas ten emerge from the ground. If they are immature and still growing, this would explain the absence of spores. If they are not growing, and are in fact hematite, then the only other reasonable explanation is that a powerful wind uncovered these specimens by blowing away dust, dirt, and sand. Figure 8. Sol 1145-left v Sol 1148-right). 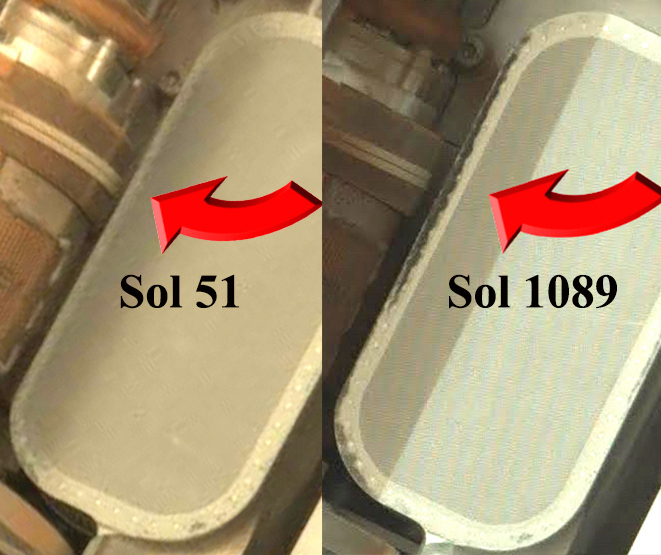 Comparing Sol 1145-left vs Sol 1148-right. Growth of fifteen Martian specimens over three days. Specimens labeled 1-5 and marked with red circles have increased in size. Those specified by arrows--Sol 1148-right--demarcate the emergence of ten new specimens which were not visible in Sol 1145-left photographed three days earlier by NASA/JPL. Differences in photo quality are secondary to changes in camera-closeup-focus by NASA. The majority of experts in fungi, lichens, geomorphology, and mineralogy agreed these are likely living specimens, i.e. fungi, puffballs. An alternate explanation is a strong wind uncovered hematite which had been buried beneath sand and dirt. 10. Wind or Fungal Growth? The Opportunity was not equipped to measure wind. However, Opportunity has been subject to extremely dusty conditions. For example, in December of 2013 the average dust factor was estimated by NASA to be .467 (very dusty); 0.964 (mildly dusty) in May of 2014; and 0.725 (moderately dusty) in June of 2016 (NASA 2018). In fact, rather than strong Martian winds blowing away dust, sand, and dirt, they have instead blanketed the Opportunity and its solar panels with so much debris that Opportunity has been subject to repeated episodes of reduced power (e.g. from 700 watt hours to 400), thereby severely limiting its activities. Furthermore, because of dust, Opportunity twice stopped functioning for long periods, including in July of 2007 when solar-panel output dropped to 128 watt hours (NASA 2007) and in June of 2018 when Opportunity finally ceased to function (NASA 2018) and has yet to recover as of February 14, 2019. Given these dusty conditions, what is the likelihood that a strong wind would have uncovered the specimens in Figure 8, and not covered them up (and the Opportunity's solar panels) with dust, sand, and dirt? The answer is unknown and a cleansing wind remains a distinct and reasonable possibility. Figure 9. Mars Sol 2718 vs Sol 2813-- The exact cause or identity of this specimen (right) is unknown but may represent possible growth of what appears to be a mass of bacteria and fungi on the Mars Rover, Opportunity, after 95 (Martian) days. Photo, NASA/JPL. 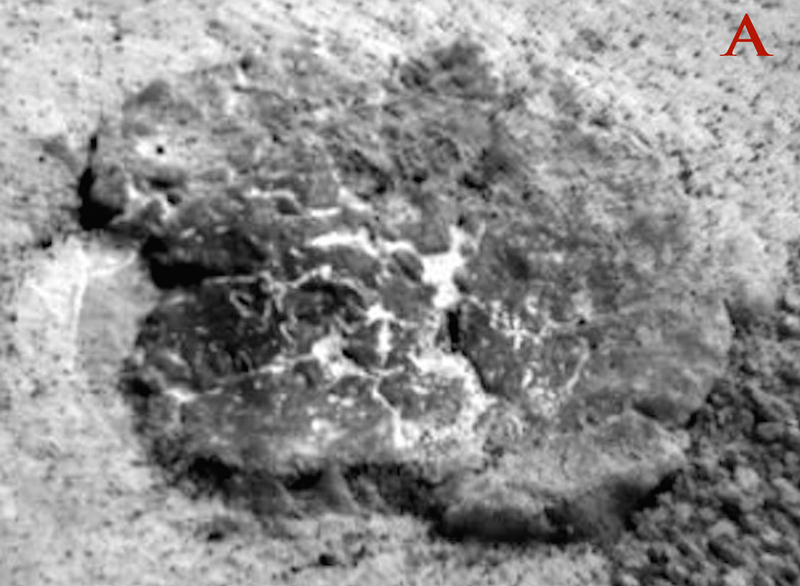 The wind explanation cannot explain why before and after photos, taken by NASA, depict what appears to be large masses of bacteria and fungi growing on the rovers Opportunity and Curiosity (Figures 9, 10, 11, 12). 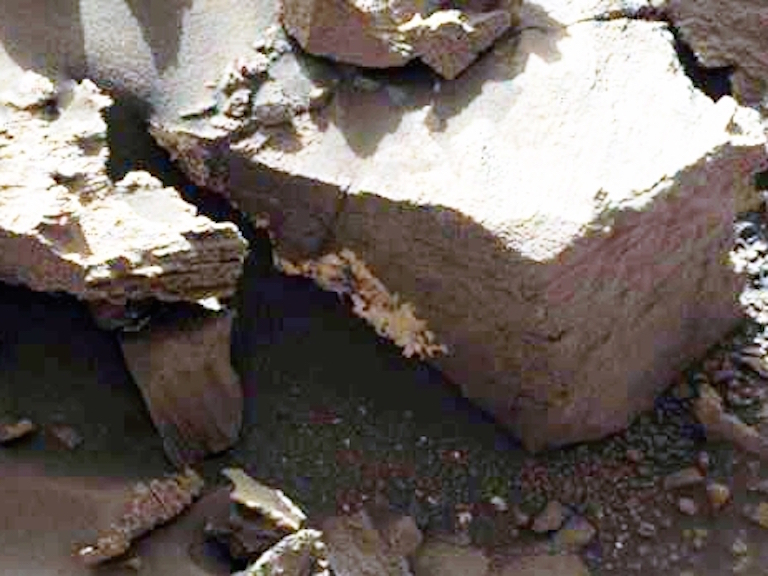 Moreover, what experts identified as fungi growing beneath a Martian rock shelter (Figure 14) is very similar to what appears to be fungi (and biocorrosion) within the shelter of the Curiosity's upper deck (Figures 12, 14). Wind is not a likely explanation for what appears to be biological growth on the rovers. Instead the evidence supports the hypothesis that fungi (and lichens) may have colonized and are growing on Mars. Figure 10. Mars Sol 51 vs Sol 1089--Growth of what appears to be a mass of bacteria and fungi on the Mars Rover Curiosity after 1038 Martian days. An alternate explanation is dust and dirt accumulated selectively in this area of the rover. Photo NASA/JPL. Figure 11. Sol 51. Mastcam photo of the interior, flooring and shelter of an exposed enclosed compartment in the rover Curiosity's chem cam deck after 51 Martian days. Photo by NASA/JPL. Figure 12. Sol 1089. Possible Fungal contamination or bio-corrosion of the interior, walls, flooring, and shelter of an enclosed compartment in the rover Curiosity's chem cam deck after 1089 Martian days? (Compare with Figure 11). Another possibility: chemical contamination or sand and salt which adhered only to the interior surface? Photo Mastcam, by NASA/JPL. Figure 13. Sol 1162, Rover Curiosity. Experts identified the white specimens as fungi (Joseph 2016). Figure 14. 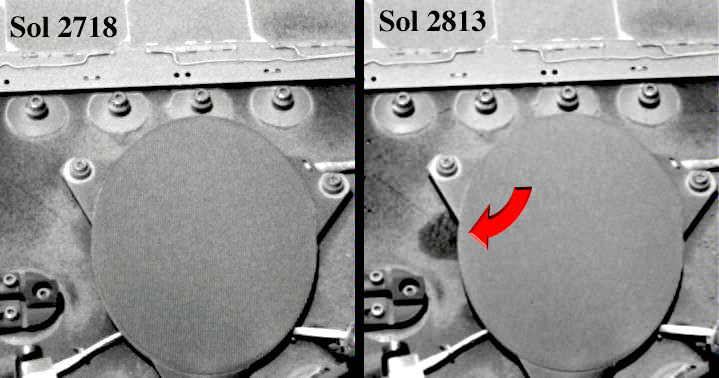 Comparison of an exposed compartment in Curiosity's Chem Cam Deck (Sol 1089 / Left, Figure 12) with Sol 1162 (Right, Figure 13). If this represents coincidence or contamination is unknown. 11. The Biology of Hematite? 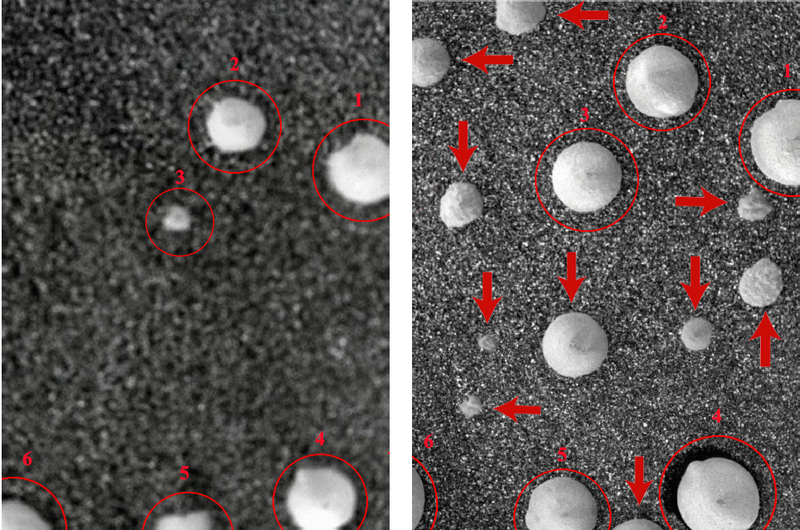 Four independent investigators and a majority of experts in fungi, lichens, geomorphology, and mineralogy favor a biological explanation for Martian specimens resembling fungi/puffballs as depicted in Figures 5, 6, and 8. NASA (2009) and Squyres and colleagues (2004) argue in favor of hematite and have provided evidence in support of this hypothesis. Hematite, however, is not evidence against biology, but might be further proof of biology. There is evidence that prokaryotes and fungi may play a role in the formation and cementing together of this mineral (Ayupova et al. 2016; Claeys 2006; Owocki et al. 2016). NASA has identified what may be "hematite" on the Martian surface as based on photographs utilizing color filters taken from space by NASA's Mars Global Surveyor spacecraft's infrared spectrometer (NASA 2009). Chemical (but non-biological) studies at ground level--via the Rovers "Opportunity" and "Spirit"--also detected the presence of hematite (Squyres et al. 2004). Hematite is a mineralized iron oxide which, over thousands of years, slowly forms in hot springs (Anthony et al. 2005; Morel 2013), as well as in volcanoes when temperatures rise above 950 C (1740 F). NASA (2009) and Squyres et al. (2004) have argued that Martian hematite was most likely created in boiling hot springs and hydrothermal vents billions of years ago. Likewise, numerous species of bacteria and archaea flourish in hot springs and hydrothermal vents including anaerobic hyperthermophiles, sulfate reducing bacteria (Desulfovibrio desulfuricans), and microbes such as thermophilic archaebacteria Thermus aquaticus (Gerday & Glansdorff 2007; Durvasula & Rao 2018; Robb et al. 2007). And, as noted, there is evidence hematite may be formed in association with biological activity (Ayupova et al 2016; Bosea et al. 2009; Claeys 2006; Fredrickson et al., 2008; Gralnick & Hau 2007; Owocki et al. 2016). On Earth, hematite filaments and tubes are similar to structures produced by iron-oxidizing bacteria which suggests the former are fashioned by the latter (Ayupova et al 2016; Claeys 2006; Rajendrana et al. 2017). Moreover, there is evidence that a variety of bacteria help form (by cementing together) or feed upon hematite by extracting energy from iron which precipitates hematite formation (Bosea et al. 2009; Fredrickson et al. 2008; Gralnick & Hau 2007). Oolitic hematite, for example, is fashioned when sediment particles (ooids) on the seafloor accumulate thin layers of lime. Bacteria replace the lime thus assisting in the fashioning of hematite (Claeys 2006; Lowy et al. 2006). Likewise, anaerobes such as Shewanella--a gram-negative, proteobacteria--grows and feeds on hematite and respires on a variety of organic electron acceptors found in hematite (Bosea et al. 2009; Fredrickson et al. 2008, Gralnick & Hau 2007; Lowy et al. 2006). Fungi may also play a major role in hematite formation (Ayupova et al. 2016, Claeys 2006; Owocki et al. 2016), the mineral substrates of which have been found "attached to fungal filaments, embedded in the fungal mycelium" (Claeys 2006). As determined by Clayes (2006) fungal interactions with hematite also produce "significant biomechanical and biochemical bioweathering features: strong pitting of the mineral surfaces, exfoliation, tunnelling, dissolution, honeycomb-alveolar structures, perforations, fragmentation, and cementation." There is a strong attachment of fungal hyphae to these minerals, such that "fungi engulf whole blocks of minerals in the hyphal network, irrespective of mineral surface topography" (Claeys 2006). Spherical hematite contains numerous filaments with structures similar to fungal hyphae (Ayupova et al. 2016; Claeys 2006). Hematite fashioned in hot springs or large bodies of water, therefore, may be cemented together and then shaped and fashioned via the assistance of fungal and bacterial activity (Ayupova et al. 2016; Claeys 2006, Owocki et al. 2016; Lowy et al. 2006; Morel 2013). Therefore, like the hematite of Earth, the Martian hematite identified by NASA (2009) and Squyres et al. (2004) could be, at least in part, a byproduct of biological activity and is further evidence that Mars may have been (and may still be) a living planet which was long ago colonized by fungi and prokaryotes including those typically dwelling in water. Claims of "nanobacteria" in Martian meteorite ALH 84001 have been vigorously disputed and are not an issue here. As summed up by Martel and colleagues (2012), "...structures resembling terrestrial life forms known as nanobacteria--can be deemed ambiguous at best." Likewise, there is controversy over evidence of biological residue, carbonates, and fossilized polycyclic aromatic hydrocarbons (PAHs)--a byproduct of cellular decay--discovered in ALH 84001, and other Martian meteorites (see Treiman, 2003 vs Thomas-Keprta et al. 2009). Steele et al. (2012), after examining 11 Martian meteorites, report that 10 contain a ubiquitous distribution of carbon found in association with oxide grains and magmatic minerals and which indicate an abiotic origin, perhaps secondary to Martian magmas. Treiman and Essen (2011) also favor an abiogenic explanation. Thomas-Keprta et al. (2009) agrees that much of what appears to be biological residue is probably abiogenic in origin. However, her team also argued that at least 25% is biological (McKay et al. 2009; Thomas-Keprta et al. 2009). Martel et al (2012), who argues against nanobacteria, also admits that "the presence of polycyclic aromatic hydrocarbons, magnetite crystals, carbonate globules... are compatible with living processes." In fact, the highest concentration of Martian PAHs was embedded in or found alongside those areas of the meteor rich in carbonates (Clemett et al. 1998). Moreover, the magnetotactic residue is not random, but has the characteristic chain-like organization associated with biological activity (Clemett et al. 1998; McKay et al. 1996, 2009). Hence, as based on evidence marshalled by Thomas-Keprta and colleagues (McKay et al. 1996, 2009; Thomas-Keprta et al. 2002), at least 25% of the Martian PAHs found within this ejected sediment may have been produced by carbonate and iron-eating bacteria, magnetotactic bacteria, algae, or fungi around 4 billion years ago (Thomas-Keprta et al. 2009). Moreover, the carbonates and biological residue appear to have been produced in an aqueous environment (Halevy et al. 2011; McKay et al. 1996, 2009; Thomas-Keprta et al. 2009). For example, Shaheen et al. (2015), upon measuring carbonate phases and distinct oxygen isotope compositions with ALH 84001, found several episodes of aqueous activity. Halevy et al (2011) have come to similar conclusions which they attribute to "a gradually evaporating, subsurface water body--likely a shallow aquifer (meters to tens of meters below the surface)." 13. Biology and Martian Stromatolites? A detailed analysis of Martian meteorite ALH 84001 revealed high concentrations of carbon compounds, including elongated spheroids and rounded carbonate globs and which had been recycled through water (McKay et al. 1996, 2009; Thomas-Keprta et al. 2002, 2009). Carbonates are typically found in fossil beds of dead sea life. The Martian ALH 84001 carbonate globules also contain cores rich in calcium coupled with dissolved carbonates and magnetite and iron-sulfides which were most likely produced biologically (McKay et al. 1996, 2009; Thomas-Keprta et al. 2002, 2009); i.e. carbonate- and iron-metabolizing bacteria, including cyanobacteria. The outer rims were also oxidized in a pattern typically associated with biological activity; that is reducing and rusting, secondary, perhaps, to photosynthesis, which is also a characteristic of cyanobacteria. In 2009, Rizzo and Cantasano reported observations of segmented sedimentary structures bordered by lamina and which they interpreted to be evidence of stromatolites, i.e. microbialites (Rizzo & Cantasano 2009, 2011, 2016), most likely created by photosynthesizing, carbonate metabolizing cyanobacteria living in water (Noffke 2015). In 2014, Bianciardi, Rizzo and Cantasano, conducted an extensive observational analysis of sedimentary microstructures coupled with a quantitative, objective, image analysis and compared what appears to be Martian stromatolites photographed by the Mars rover Opportunity, with terrestrial stromatolites and microbialites, so as to evaluate the geometric textural complexity vs "randomness." Bianciardi and colleagues (2014) reported that "the morphometric analysis reveals that both textures, from microbialites (Earth) and from selected MI images (Mars), present a multifractal aspect" and that "Martian and terrestrial textures were extremely similar to each other." Moreover, they found a "textural pattern that is also present in living microbialites as well in recent and fossil stromatolites... characteristic of microbial communities of cyanobacteria." Other investigators have reached similar conclusions (Ruffi & Farmer, 2016; Noffke 2015). 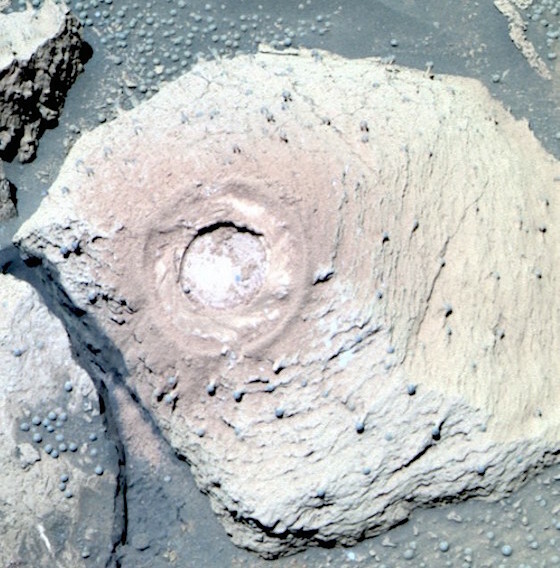 Ruffi and Farmer (2016), upon examining sediments photographed by the rover Spirit, detected silica structures which closely resemble "microbially mediated micro-stromatolites" as well what could be biofilms with filaments and sheaths. In addition, morphological analyses of sedimentary specimens--photographed by the rover Spirit, at Gusev crater--revealed microstructures organized as intertwined microspherule filaments and which are also observed in Earthly microbialites (Bianciardi et al. 2014). Noffke (2015) reported that rocks in the < 3.7 Ga Gillespie Lake region of Mars display sedimentary characteristics which mirror ecological changes over time typical of terrestrial microbiological mats and produced by biological interactions with the environment in regressive bodies of water. Based on an analysis of photographs made by Curiosity's Mastcam camera of Martian outcrops, Noffke (2015) observed macroscopic morphologies and spatial relationships associated with a temporal change in the stratigraphic succession typically produced secondary to colonization by microbial mats; i.e. "centimeter- to meter-scale structures similar in macroscopic morphology"… that include "'erosional remnants and pockets,' 'mat chips,' 'roll-ups,' 'desiccation cracks,' and 'gas domes' which do not have a random distribution but were arranged in spatial associations and temporal successions similar to the "growth of a microbially dominated ecosystem that thrived in pools that later dried completely." In a further examination of bio-mineralization processes it was found that Martian sediments are characterized by highly organized microspherules similar to terrestrial stromatolites which consist of voids, gas domes, and layer deformations due to microbial activity and gas excretions (Rizzo & Cantasano 2016). Moreover, a quantitative image statistical analysis comparing 45 microbialites samplings with 50 photographed by the rover also determined the specimens from Mars are statistically and morphologically similar to terrestrial samples with a probability of this occurring by chance being less than 1/28, p<0.004 (Bianciardi et al. 2014). These findings, therefore, supports the hypothesis that algae (cyanobacteria) may have colonized Mars over 3 billion years ago in the presence of water. Figure 15. Sol 820. Green algae, stromatolites, microbial mats, or unusual abiotic sediments? Photographed by the Rover Curiosity Mars Science Laboratory Mars Hand Lens Imager which takes color images of features as small as 12.5 micrometers and at distances between 20 mm and infinity and having a depth of field of 1.6 mm to 2 mm. Note: specimen "A" at bottom center (also depicted in Figure 16). Photograph: NASA/JPL. Figure 16. Sol 820. Specimen A (from Figure 15). Evidence of bacterial mat or an unusual abiotic sedimentary formation? Photographed by the Rover Curiosity Mars Science Laboratory Mars Hand Lens Imager. Figure 17. Microanalyses of a Martian stromatolite (top) photographed by the Rover Curiosity (Sol 506) compared with a terrestrial stromatolite from Lagoa Salgada, Brazil (bottom). Highly organized microspherules and thrombolytic microfacies are common to both. Earthly Cyanobacteria typically form voids, intertwined filaments, and layer deformation within stromatolites. It is possible these formations were produced geologically in the absence of any biological influences. 14. Evidence of Martian Algae/Cyanobacteria? Several investigators, based on an examination of photos of Martian specimens, have suggested that what appears to be algae may be present on Mars (Joseph 2014; Krupa 2018 Levin, Straat, & Benton, 1978). 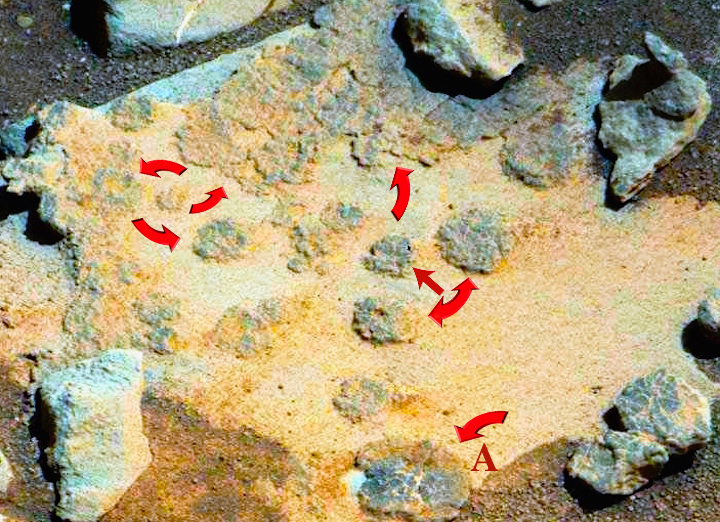 Levin et al (1978) upon closely examining photos from the 1976 Viking mission, observed what appeared to be green patches on Mars rocks which, over time, changed in size. Levin, Straat and Benton (1978) argued that changes in the green patches could represent biological activity and evidence of life (e.g. algae), or alternatively, green-colored dirt and dust. In 2017, T. A. Krupa presented evidence at the Lunar and Planetary Society of what may be green photosynthetic organisms, e.g. algae. Krupa performed a detailed analysis of low albedo, "anomalous" images from Columbia Hills in Gusev Crater, and those photographed by the Spirit Rover's Pan Cam in an area of Mars dubbed "Larry's Outcrop/Larry's Lookout." These photos were initially analyzed by employing "red," "blue," and "green" filters, which were "radiometrically corrected with the radiance correction parameters found in the image file header." These images were analyzed next with a computer Geographic Information System, SAGA. Krupa (2017) reported the analysis revealed what appears to be water pathways which may intermittently fill with water and that "the hillside at Larry's outcrop is covered by a very thin layer of green material" and "green spherules" which clearly resembles algae in the soil. Krupa (2017) concluded "that these spherules are a life form supported by that water.... and their green color suggests that the spherules contain a photosynthetic compound similar to green chlorophyll...The distribution of these spherules in a single layer...is also consistent with the hypothesis that the spherules are photosynthetic life forms," e.g., algae/cyanobacteria. Krupa's (2017) computerized analyses which revealed possible water pathways that may intermittently fill with water, is, of course an unproven hypothesis, but which is nevertheless consistent with findings of Martian water by Renno et al., (2009) and other investigators. Specifically, in 2004 the European Space Agencies' Mars orbiter found evidence of water ice and detected vapors of water molecules via an infrared camera aboard the Mars Express spacecraft which was circling the Red Planet's south pole whereas additional "water" "anomalies" were reported in 2015 (Villanueva et al. 2015). If prokaryotes and fungi contributed to the formation of Martian sedimentary structures billions of years in the past, the accumulation of these decaying organisms should also be a source of sedimentary and atmospheric methane. As based on simulation studies (Tarasashvili et al., 2013), methanogens can flourish in a Mars-like environment. If methanogens have colonized Mars, they too would be a source of methane. In fact, high levels of methane have been detected at ground level and in the atmosphere of Mars and which varies in concentration depending on the season and which is continually replenished (Formisano et al. 2004; Mumma et al. 2004, 2009; Webster et al. 2013, 2015, 2018). Specifically, it has been determined that Martian atmospheric methane levels are punctuated by major spikes in concentration which later decline, only to later increase again (Formisano et al. 2004; Mumma et al. 2004, 2009; Webster et al. 2018). Three separate methane plumes consisting of 19,000 metric tons of methane gas were detected in the Martian atmosphere by Europe's Mars Express spacecraft in 2003 (Formisano et al. 2004). Employing infrared spectrometers on three Earth-based telescopes several possible methane emission sources were found in the vicinity of Syrtis Major, Arabia Terra, and Nili Fossae in the southern and northern hemispheres (Formisano et al. 2004; Mumma et al. 2004). In July of 2013, "an upper limit of 2.7 parts per billion of methane" was detected in the vicinity of the Gale Crater fluctuating between a value of 0.18 ppbv to 1.3 ppbv as measured on September of 2013 (Webster et al. 2013). A "tenfold spike" in methane levels followed with increases in late 2013 and early 2014, averaging "7 parts of methane per billion in the atmosphere" (Webster et al. 2015). In 2018, Webster and colleagues reported that "in situ measurements at Gale crater made over a five-year period by the Tunable Laser Spectrometer on the Curiosity rover "revealed a strong, repeatable seasonal variation...which is greater than that predicted from either ultraviolet degradation of impact-delivered organics on the surface or from the annual surface pressure cycle." According to Webster et al (2018), the findings "are consistent with small localized sources of methane released from Martian surface or subsurface reservoirs." For example, Rasmussen and Khalil (1981) found "stable seasonal cycles with peak concentrations in October and minimum concentrations in July." In 1983 these investigators reported that in the southern hemisphere the lowest concentrations are found during the late Australian summer and fall; likewise, there is less atmospheric methane in the northern hemisphere during summer. These seasonal variations have as their source biological activity in wetlands (Chen et al. 2008; Whalen 2005) and on farms and in rice paddies, just prior to harvest (Chen et al. 2008; Cicerone et al. 1983). Chen et al. (2008) report a direct correlation between atmospheric methane and the growing seasons (14.45 mg CH4 m-2 h-1 [0.17 to 86.78 mg CH4 m-2 h-1) vs non-growing seasons (0.556 mg CH4 m-2 h-1 (0.002 to 6.722 mg CH4 m-2 h-1). Major contributing factors include surface temperatures, standing water depths, and the degree of plant growth, whereas in anerobic environments the absence of oxygen and the amount of degradable material are controlling influences. Based on a thorough review of the evidence, Whalen (2005) determined that "emission from wetlands is also a significant component of the atmospheric CH4 budget...about 25% of total emissions from all anthropogenic and natural sources." Much of "this methane is produced by subsurface, anaerobic methanogenic bacteria and surficial oxidation by methanotrophic bacteria." As documented in this report, methanogens, cyanobacteria, fungi, and lichens can easily survive in a Mars-like environment. Further there is evidence that these same species of prokaryote and eukaryotes have colonized Mars and that there is water beneath and above the surface. Although considered controversial, NASA's 1976 Viking Labeled Release (VLR) studies, at two landing sites 4,000 miles apart on Mars, detected evidence of surface biological activity that could be attributed to fungi, lichens, algae, and a variety of prokaryotes (Levin & Straat, 1976, 1977, 1979a,b, 2016). In 2009 Levin and Straat also argued that perhaps 25% of the gasses released during the experiments could have been methane attributed to methanogens. It is also well established that fungi and stromatolite-building cyanobacteria (algae) produce and are sources of methane (Hansson 1983; Klassen et al. 2017; Lenhart et al. 2012). Fungi and other eukaryotes generate methane via interactions with methanogenic archaea (see Olsson et al. 2017). Algae and Saprotrophic fungi also produce methane independently of archaea (Hansson 1983; Klassen et al. 2017; Lenhart, et al. 2012) whereas fungal (and archaea) methane production is inhibited by the presence of oxygen and increases with increased levels of carbon dioxide (Lenhart, et al. 2012)--a finding which is true for most methane-producing species. Therefore, Mars is an ideal habitat for methanogens as there are minimal levels of free oxygen and the atmosphere is 96% carbon dioxide (Mahaffy et al. 2013), whereas the electron acceptor in methanogenesis is carbon dioxide. Martian radiation may also promote the biological production of methane. It has been established that saprotrophic micro-fungi biologically decompose carbon-based radioactive debris from the damaged Chernobyl nuclear reactor (Zhdanova et al., 1991). Saprotrophic fungi are even adapted for accumulation and uptake of radiocesium fallout (Dighton et al. 1991) and, as noted, are a source of methane (Lenhart, et al. 2012). As indicated by Figures 8, 9, 10, 12, there is evidence of Martian fungal growth. Hence, it would be expected that the growth and biological activity of any Martian organisms might wax and wane, thereby resulting in a waxing and waning of Martian methane and contributing to seasonal variations. Using Earth as an example, the most probable contributors to seasonal variations in Martian methane emissions are variations in water availability, temperature, degradable and methanogen biomass and the growth and decay of various organisms. As there no evidence of any significant abiotic methane production on Mars (Khayat et al. 2017; Roos-Serote et al. 2016; Webster et al. 2018), and given that 90% of terrestrial methane is biological in origin, it is reasonable to assume biological activity is the primary source of fluctuating levels of and seasonal variations in Martian methane. 16. Geology of Martian Methane? Certainly, and as most investigators insist, it is possible that Martian methane is produced geologically and through abiogenic processes. Perhaps Martian methane is vented periodically and naturally released via gas permeable fissures; faults and fractures in rocks; sandstone and sediment; and the leakage of deep gas reservoirs through geothermal activity, and especially through vents leading deep beneath the surface from inactive mud-volcanoes as these are the source of abiogenic methane on Earth (U.S. Department of Energy, 2017; Etiope & Klusman 2002; Vanneste et al. 2001). Khayat and colleagues (2017), however, searching for geological sources found none. Khayat et al. (2017) examined two volcanic districts via a high resolution spectrometer at NASA's Infrared Telescope Facility and using the high resolution heterodyne receiver at the James Clerk Maxwell Telescope facility, and "no active release of such gasses was detected." Organic molecules are also a source of terrestrial methane (U.S. Department of Energy, 2017) and several investigators have reported what may be trace amounts of organic molecules on the surface of Mars (Ming et al. 2009; Sutter et al. 2016) which has been attributed to material deposited by meteors and dust drifting down from space (Frantseva et al. 2018; Moores & Schuerberg 2012; Schuerger et al. 2012). Therefore, it's been argued, Martian methane is produced by comets and meteors and via the UV photolysis of the minimal amounts of organic carbon drifting down upon the surface (Fries et al. 2015; Keppler et al. 2012). However, as determined by Webster et al. (2018) these scenarios cannot account for the variations, levels and amount of methane so far detected which are far "greater than that predicted from either ultraviolet degradation of impact-delivered organics on the surface or from the annual surface pressure cycle." Furthermore and as summed by Roos-Serote, Atreva, Webster and colleagues (2016), "We find no compelling evidence for any correlation between atmospheric methane and predicted meteor events." Moreover, UV photolysis of Martian organic carbon is carbon-limited and constrained by the accretion rate of IDP organics (Moores & Schuerberg 2012). There is insufficient carbon on the surface (Bieman et al. 1976; Ming et al. 2009) to account for the varying and large concentrations of methane which are periodically pumped into the Martian atmosphere (Moores & Schuerberg 2012). And, organics buried one to two mm below ground would not be subject to UV photolysis, and any methane could only be liberated biologically (U.S. Department of Energy, 2017; U.S. Department of Agriculture 2017). Certainly there is a likely abiogenic contribution to Martian methane. However, as on Earth, that contribution appears to be minimal. By contrast, there is evidence of biological activity, including the growth of what appears to be fungi, algae and lichens, on the Martian surface; and on Earth 90% of methane is biological in origin. Thus, the most logical, scientific explanation for the replenishment of and seasonal fluctuations in Martian methane is biological activity--the first evidence of which may have been discovered by the Viking Labeled Release experiments (Klein et al. 1976; Levin 2010; Levin & Straat 1976, 2009, 2016). 17. The Viking Labeled Release Experiment Detects Biological Activity on Mars? As summarized by Levin (2010; Levin & Straat 2016), the Viking Labeled Release (LR) experiments were designed to detect biological activity on Mars. Thousands of field tests were performed and it was proved the LR experiment was capable of accurately detecting a very wide range of microorganisms including aerobic, anaerobic, and facultative bacteria, as well as lichens, fungi, and algae. Once on Mars a nutrient containing radioactive carbon was added to a Martian soil sample and the presence of radioactivity in the gasses released served as evidence of active metabolism. A control experiment heat-treated a second sample to kill microorganisms. Positive results including evidence of biological metabolism were obtained from the raw sample which was not subject to extreme heat-sterilization. By contrast, when soil samples were heated to 50°C, biological activity decreased by 65%. When Martian soil was pre-heated to 160°C there was no evidence of biology. When two samples of Martian soil were stored at approximately 10°C for long time periods there was a 90% and 100% reduction in activity. When not subject to sterilization, robust evidence of biological metabolism and increases in activity were obtained (Klein et al. 1976). As described by Levin and Straat (2016), the LR instruments operated flawlessly on Mars. Both Viking landing sites, some 4,000 miles apart, produced strong responses and met the pre-mission criteria for the detection of life. To distinguish between non-biological and biological agents, additional experiments were executed via commands from Earth. Each such ad hoc series of tests again demonstrated on-going Martian metabolism. Four different LR experiments were conducted, each of which yielded positive results, and five controls, all of which supported the positive results as biological. Levin concluded that the "amplitudes and kinetics of the Mars LR results were similar to those of terrestrial results, especially close to those of soils in, or from, frigid areas," and that the LR experiment had found evidence of biological activity on Mars (Levin 2010; Levin & Straat 1976, 1979a,b, 2016). The results, however, were rejected by NASA administrators who argued that since the addition of more nutrients into the soil temporarily decreased the level of biological activity "the LR therefore had not detected life on Mars, but had detected a chemical or physical agent that had produced false positive results" (Levin 2010). NASA's arguments (detailed on the NASA/Mars website), though interesting, are not based on factual evidence, but post-hoc theorizing and the interested reader is encouraged to review NASA's claims to arrive at their own conclusions. In fact, according to Levin (2010) "NASA-bonded Antarctic soil 664 had reacted to its second injection as had the Martian soils" and "the decline in gas level was caused by re-adsorption of the evolved gas into the dampened soil." That only trace amounts of carbon and organic molecules have been detected on Mars (Bieman et al. 1976, 1977; Ming et al. 2009; Sutter et al. 2016) also does not support NASA's physical-chemical-false-positive hypothesis. Subsequently, Bianciardi, Miller, Straat, and Levin (2012) performed a mathematical complexity deep analysis of the Viking LR data, employing seven complexity variables. It was determined that the Viking LR positive responses demonstrated a different pattern from control responses which resembled near-random noise. By contrast, the active experiments exhibited highly organized responses typical of biology. We have presented a body of observations and evidence which supports the hypothesis Mars may have been, and may still be, a living planet. Although disagreements and differing interpretations and hypotheses abound, there is no factual, scientific evidence proving or even strongly supporting a purely abiotic explanation for the data and observations presented here which we believe favors biology. Thus, the null hypothesis is rejected. Admittedly, abiogenic factors can't be ruled out. Conversely, at present, there is no microscopic evidence depicting cells or intra-cellular structure and thus no definitive proof of Martian life. Moreover, although organisms can survive in space or in simulated Mars-like environments, there is no proof they can flourish on Mars. It is also very difficult to distinguish, with a high level of confidence, between what may be living organisms vs sedimentary structures. Similarities in morphology are not proof. In many respects the observations presented here could be described as circumstantial and do not rise to the level of "extraordinary evidence" thus precluding "extraordinary claims." Although, collectively, the evidence, in total, weighs in favor of biology, we can only conclude that the question of life on Mars remains unanswered. Fourteen qualified experts (eight Senior Editors and six independent scientists) refereed and peer reviewed "Evidence of Life on Mars?" Eleven experts in total recommended publication and of the eight Editors three rejected the article. The experts have a publication history in the following areas of science: Microbiology, Biochemistry, Biogeology, Mars Viking Experiments, Fungi, Lichens, Methanogens, Extremophiles, Mars-Simulated Environments, Martian Atmosphere, Martian Meteors, Radiation Biology. Adey. W. R. (1993). Biological Effects of Electromagnetic Fields. Journal of Cellular Biochemistry 51:410-416. Alshits LK, Kulikov NV, Shevchenko VA, Yushkov PI. 1981. Changes in radiosensitivity of pea seeds affected by low level radiation. Radiobiol 21:459-463. Anthony, J. W., Bideaux, R. A., Bladh, K. W., Nichols, M. C. (2005.). "Hematite". Handbook of Mineralogy. Mineralogical Society of America. Chantilly, VA, ISBN 0962209724. Armstrong R.A. (2017) Adaptation of Lichens to Extreme Conditions. In: Shukla V., Kumar S., Kumar N. (eds) Plant Adaptation Strategies in Changing Environment. Springer, Singapore. Arrhenius, S. (1908). Worlds in the Making. Harper & Brothers, New York. Basset C.AL. (1993). Beneficial effects of electromagnetic fields. J Cell Biochem 31:387-393. Becker RO. (1984). Electromagnetic controls over biological growth processes. Journal of Bioelectricity 3:105-118. Becker RO, Sparado JA. (1972). Electrical stimulation of partial limb regeneration in mammals. Bull NY Acad Med 48:627- 641. Becket, K. et al. (2008). Stress Tolerance in Lichens. In Lichen Biology (T, H. Nash III Ed) Cambridge University Press. Bianciardi, G., Miller, J. D., Straat, P.N., Levin, G. V. (2012). Complexity Analysis of the Viking Labeled Release Experiments, Int'l J. of Aeronautical & Space Sci. 13(1), 14-26. Bianciardi, G., Rizzo, V., Cantasano, N. (2014). Opportunity Rover's image analysis: Microbialites on Mars? International Journal of Aeronautical and Space Sciences, 15 (4) 419-433. Bianciardi, G., Rizzo, V., Farias, M. E., & Cantasano (2015). Microbialites at Gusev Craters, Mars. Astrobiology Outreach, 2,5. Biemann, K., J. Oro, P. Toulmin III, L. E. Orgel, A. O. Nier, D. M. Anderson, D. Flory, A. V. Diaz, D. R. Rushneck, and P. G. Simmonds (1976), Search for organic and volatile inorganic compounds in two surface samples fromthe Chryse Planitia region of Mars,Science,194(4260), 72-76,doi:10.1126/science.194.4260.72. Bosea, S., HochellaJr., M. F., .Gorby, Y.A. Kennedy, D. W., McCready, D. E., Madden, A. S., Lower, B. H. (2009) Bioreduction of hematite nanoparticles by the dissimilatory iron reducing bacterium Shewanella oneidensis MR-1, Geochimica et Cosmochimica Acta, 73, Issue 4, 962-976. Brandt, A., et al. (2015). Viability of the lichen Xanthoria elegans and its symbionts after 18 months of space exposure and simulated Mars conditions on the ISS--International Journal of Astrobiology, 14, 411-425. Brodie, E. L., DeSantis, T.Z., Parker, J. P. M., Zubietta, I. X., Piceno, Y. M., Andersen, G. L. (2007). Urban aerosols harbor diverse and dynamic bacterial populations PNAS. 104, 299-304. Bruhn, D., et al. (2012) Terrestrial plant methane production and emission. Physiol. Plant 144, 201-209. Burchell, M. J., Manna, J., Bunch, A. W., Brandob, P. F. B. (2001). Survivability of bacteria in hypervelocity impact, Icarus. 154, 545-547. Burchell, M. J. Mann, J., Bunch, A. W. (2004). Survival of bacteria and spores under extreme shock pressures, Monthly Notices of the Royal Astronomical Society, 352, 1273-1278. Calabrese EJ, Baldwin LA. (1999). Tales of two similar hypotheses: the rise and fall of chemical and radiation hormesis. BELLE Newslett 8:47-66. Cicerone, R. J., Shetter, J. D., Delwiche, C. C. (1983). Seasonal variation of methane flux from a California rice paddy, JGR Oceans, 1983, 88, 11022-11024. Clement, S. J., M. T. Dulay, J. S. Gillette, X. D. Chillier, T. B. Mahajan, and R. N. Zare. (1998). Evidence for the extraterrestrial origin of polycyclic aromatic hydrocarbons in the Martian meteorite ALH84001. Faraday Discuss. 109:417-436.
al and Planetary Change. 9, 263-273. Dadachova E., Bryan RA, Huang X, Moadel T, Schweitzer AD, Aisen P, et al. (2007) Ionizing Radiation Changes the Electronic Properties of Melanin PLoS One, doi:10.1371/journal.pone.0000457. Dass, R. S. (2017) The High Probability of Life on Mars: A Brief Review of the Evidence, Cosmology, Vol 27, April 15, 2017. 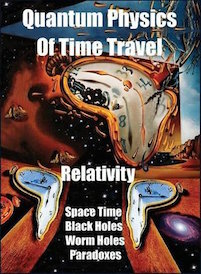 Davies, P. C. W. (2007) The Transfer of Viable Microorganisms Between Planets, (Editors Gregoy R. Bock Jamie A.) Novartis Foundation Symposia. De Vera, J. -P. et al. (2014). Results on the survival of cryptobiotic cyanobacteria samples after exposure to Mars-like environmental conditions, International Journal of Astrobiology, 13, 35-44. De Vera, J. -P. (2012). Lichens as survivors in space and on Mars. Fungal Ecology, 5, 472-479. Dighton, J, Tatyana Tugay, T., ZhdanovaN., (2008) Fungi and ionizing radiation from radionuclides, FEMS Microbiol Lett 281, 109-120. 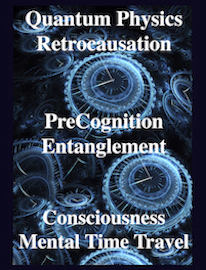 Dohm, J.M., Anderson, R.C., Barlow, N.G., et al. (2008) Recent geological and hydrological activity on Mars: The Tharsis/Elysium Corridor. Planet. Space Sci. 56, 985-1013. Dohm, J.M., Barlow, N.G., Anderson, R.C., et al. (2007) Possible ancient giant basin and related water enrichment in the Arabia Terra province, Mars. Icarus, doi: 10.1016/j.icarus.2007.03.006. Drewnowska, J. M., et al. (2015) "Melanin-Like Pigment Synthesis by Soil Bacillus weihenstephanensis Isolates from Northeastern Poland, Plos One. 2015, dx.doi.org/10.1371/journal.pone. Durvasula R. V., Rao, D.V.S (2018), Extremophiles: From Biology to Biotechnology, CRC Press. Etiope, G., &.Klusman, R. W. (2002). Geologic emissions of methane to the atmosphere, Chemosphere, 49, 777-789.
een Earth and Mars as a result of natural impact phenomena and human spaceflight activities, Acta Astronautica, 60, 534-540. Frantseva, K., Mueller. M., Kate, I. L., van der Tak, F.F.S., Greenstreetde, S. (2018). Delivery of organics to Mars through asteroid and comet impacts. Icarus, 309, 125-133. Fredrickson, J, et al. (2008). Towards environmental systems biology of Shewanella." Nature Reviews in Microbiology. Volume 6:592-603. Fries, M., et al. (2015), A cometary origin for Martian atmospheric methane, Geochem. Perspect. Lett., 2, 10-23. Gerday, C. & Glansdorff, N. (2007) Physiology and Biochemistry of Extremophiles, ASM press. Gostincar, C., Grube, M., de Hoog, S., Zalar, P., and Cimerman, N. G. (2010) Extremotolerance in fungi evolution on the edge. FEMS Microbiology Ecology, 71: 2-11. Gralnick, R., & Hau, S. (2007). Ecology and biotechnology of genus Shewanella." Annu Rev Microbiol. 61:237-58. Gupta, V. K., R. L. Mach, and S. Sreenivasaprasad (2015) Fungal Biomolecules: Sources, Applications and Recent Developments," Wily. Halevy, I., Fischer, W. W., Eiler. J. M. (2011). Carbonates in the Martian meteorite Allan Hills 84001 formed at 18 ± 4 °C in a near-surface aqueous environment. PNAS, 108 (41) 16895-16899. Hara, T. et al. (2010). Transfer of Life-Bearing Meteorites from Earth to Other Planets. Journal of Cosmology, 7, 1731-1742. Horneck, G., Bücker, H., Reitz, G. (1994). Long-term survival of bacterial spores in space. Advances in Space Research, Volume 14, 41-45. Horneck, G. Mileikowsky, C., Melosh, H. J., Wilson, J. W. Cucinotta F. A., Gladman, B. (2002). Viable Transfer of Microorganisms in the solar system and beyond, In G. Horneck & C. Baumstark-Khan. Astrobiology, Springer. Imshenetsky, A.A., Lysenko, S.V., Kazakov,G.A. (1978). Upper boundary of the biosphere. Applied and Environmental Microbiology, 35, 1-5. Ito, H, Watanabe H, Takeshia M. & Iizuka H (1983). Isolation and identification of radiation-resistant cocci belonging to the genus Deinococcus from sewage sludges and animal feeds. Agric". Biol. Chem. 47: 1239-47. doi:10.1271/bbb1961.47.1239. Jonsson, A.V., Moen, J., Palmqvist, K. (2008). Predicting lichen hydration using biophysical models. Journal of the Royal Society Interface, Oecologia, 156:259-273. Joseph, R. (2014) Life on Mars: Lichens, Fungi, Algae, Cosmology, 22, 40-62. Joseph, R. (2016) A High Probability of Life on Mars, The Consensus of 70 Experts Cosmology, 25, 1-25. Joseph, R. & Schild, R. (2010). Biological Cosmology. Journal of Cosmology, 10. 40-75. Kepler, F., et al., (2006) Methane emissions from terrestrial plants under aerobic conditions. Nature 439, 187-191. Keppler, F. et al. (2012). Ultraviolet-radiation-induced methane emissions from meteorites and the Martian atmosphere. Nature, 486, 93-96. Khayat, A.S.J., villanuevaam, G.L., Mumma, M. J., Tokunagac, A.T. (2017). A deep search for the release of volcanic gases on Mars using ground-based high-resolution infrared and submillimeter spectroscopy: Sensitive upper limits for OCS and SO2. Icarus, 296, 1-14. Krupa, T. A. (2017). Flowing water with a photosynthetic life form in Gusav Crater on Mars, Lunar and Planetary Society, XLVIII. La Duc, M. T., K. Venkateswaran, and C. A. Conley (2014) A genetic inventory of spacecraft and associated surfaces. Astrobiology. 2014;14:15- 23. Lenhart K. et al. (2012) Evidence for methane production by saprotrophic fungi. Nat Commun. 2012;3:1046. doi: 10.1038/ncomms2049. Levin, G. (2010). Extant Life on Mars: Resolving the Issues, Journal of Cosmology, 5, 920-929. Levin, G., Straat, P. A. (1976) Viking Labeled Release Biology Experiment: Interim Results, Science, 194, 1322-1329. Levin, G. V., Straat, P. A. (1976) Labeled Release - An Experiment in Radiorespirometry" Origins of Life, 7, 293-311. Levin, G. V., Straat, P. A. (1977) Life on Mars? The Viking labeled release experiment, Biosystems 9 :2-3, pp. 165-174. Levin, G. V., Straat , P. A. (1979a) Completion of the Viking Labeled Release Experiment on Mars, J. Mol. Evol., 14, 167-183. Levin, G. V., P. A. Straat, (2009). The Likelihood of Methane-producing Microbes on Mars," Instruments, Methods, and Missions for Astrobiology XII, SPIE Proc., vol. 7441, invited paper 744110D. Levin, G.V., Straat, P.A., and Benton, W.D. (1978) Color and Feature Changes at Mars Viking Lander Site. J. Theor. Biol., 75: 381-390. Levin, M. (2003). Review: Bioelectromagnetics in Morphogenesis. Bioelectromagnetics 24:295-315. Maffei, M. E. (2014). Magnetic field effects on plant growth, development, and evolution (2014). Front. Plant Sci., 04. Mahaffy, P. R. et al., (2012) The Sample Analysis at Mars Investigation and Instrument Suite. Space Sci. Rev. 170, 40-478. Mahaffy P. R. et al. (2013) Abundance and isotopic composition of gases in the martian atmosphere from the Curiosity rover. Science 341, 263-266. Mahaney, W. C. & Dohm, J. (2010) Life on Mars? Microbes in Mars-like Antarctic Environments, Journal of Cosmology, 5, 951-958. Malin, M. C., Edgett, K. S., (1999). Oceans or Seas in the Martian Northern Lowlands: High Resolution Imaging Tests of Proposed Coastlines, Geophys. Res. Letters, V. 26, No. 19, p. 3049-3052. Malin MC, Edgett KS. (2000). Evidence for recent groundwater seepage and surface runoff on Mars. Science 288(5475):2330-2335. Martel, J., Young,D., Peng, H-H., Wu,C-W., Young, J. D. (2012). Biomimetic Properties of Minerals and the Search for Life in the Martian Meteorite ALH84001-042711-10540. Annual Review of Earth and Planetary Sciences Volume 40, 167-193. Mastrapaa, R.M.E., Glanzbergb, H ., Headc, J.N., Melosha, H.J, Nicholsonb, W.L. (2001). Survival of bacteria exposed to extreme acceleration: implications for panspermia, Earth and Planetary Science Letters 189, 30 1-8.
on Mars: new evidence from martian meteorites. In, Instruments and Methods for Astrobiology and Planetary Missions, 7441, 744102. McLean, R.J.C., Welsh, A.K., Casasanto, V.A., (2006). Microbial survival in space shuttle crash. Icarus 181, 323-325. McLean, R.J.C., McLean, M. A. C. (2010). Microbial survival mechanisms and the interplanetary transfer of life through space. Journal of Cosmology, 7, 1802-1820. Melosh, H. J. (2003). Exchange of Meteorites (and Life?) Between Stellar Systems. Astrobiology, 3, 207-215. Mickol, R.L., Kral, T. A. (2017). Low Pressure Tolerance by Methanogens in an Aqueous Environment: Implications for Subsurface Life on Mars. Origins of Life and Evolution of Biospheres, 47, 511-532. Mileikowskya. C., et al. (2000), Risks threatening viable transfer of microbes between bodies in our solar system Planetary and Space Science, 48, 1107-1115. Mileikowsky, C., Cucinotta, F.A., Wilson, J.W., Gladman, B., Horneck, G., Lindegren, L., Melosh, J., Rickman, H., Valtonen, M., Zheng, J.Q. (2000), Icarus, 145, 391-427. Ming, D. W., H. V. Lauer Jr., P. D. Archer Jr., B. Sutter, D. C. Goldern,R. V. Morris, P. B. Niles and W. V. Boynton (2009), Combustion of organic molecules by the thermal decomposition of perchlorate salts:Implications for organics at the Mars Phoenix Scout landing site,Proc.Lunar Planet. Sci. Conf.,40, Abstract 2241. Mitchell, F. J., & Ellis, W. L. (1971). Surveyor III: Bacterium isolated from lunar retrieved TV camera. In A.A. Levinson (ed), Proceedings of the second lunar science Conference, MIT press, Cambridge. Moeller, R., et al. (2012). Protective Role of Spore Structural Components in Determining Bacillus subtilis Spore Resistance to Simulated Mars Surface Conditions. Applied and Environmental Microbiology, DOI: 10.1128/AEM.02527-12. Moores, J. E., Schuerger, A. C. (2012). UV degradation of accreted organics on Mars: IDP longevity, surface reservoir of organics, and relevance to the detectionof methane in the atmosphere, Journal of Geophysical Research, Vol. 117, E08008, doi:10.1029/2012JE004060. Moseley BE, & Mattingly A (1971). Repair of irradiated transforming deoxyribonucleic acid in wild type and a radiation- sensitive mutant of Micrococcus radiodurans". J. Bacteriol. 105 (3): 976-83. PMC 248526 Freely accessible. PMID 4929286. Mukhin, V. & Voronin, P. (2007) Methane emission during wood fungal decomposition. Doklady Biol. Sci. 413, 159-160. Mumma, M.J., Novak, R.E., DiSanti, M.A., Bonev, B.P., (2003) A sensitive search for methane on Mars. Bull. Am. Astron. Soc. 35, 937. Mumma, M.J., Villanueva, G.L., Novak, R.E., Hewagama, T., Bonev, B.P., DiSanti, M.A., Mandell, A.M., and Smith, M.D. (2009) Strong release of methane on Mars in northern summer 2003. Science. doi:10.1126/science.11,65,243. Navarro-Gonzalez, R., Rainey, F.A., Molina, P., Bagaley, D.R., Hollen, B.J., de la Rosa, J., Small, A.M., Quinn, R.C., Grunthaner, F.J., Caceres, L., Gomez-Silva, B., McKay, C.P. 2003, Science (New York, N.Y, 302(5647), pp. 1018-1021. Nicholson, W. L., Munakata, N., Horneck, G., Melosh, H. J., Setlow, P. (2000). Resistance of Bacillus Endospores to Extreme Terrestrial and Extraterrestrial Environments, Microbiology and Molecular Biology Reviews 64, 548-572. Nicholson, W.L., et al. (2012). Growth of Carnobacterium spp. from permafrost under low pressure, temperature, and anoxic atmosphere has implications for Earth microbes on Mars. PNAS. https://doi.org/10.1073/pnas.1209793110. Noffke, N. 2015. Ancient Sedimentary Structures in the < 3.7b Ga Gillespie Lake Member, Mars, That Compare in macroscopic Morphology, Spatial associations, and Temporal Succession with Terrestrial Microbialites. Astrobiology 15(2): 1-24. Olsson-Francis, K., et al. (2009). Survival of Akinetes (Resting-State Cells of Cyanobacteria) in Low Earth Orbit and Simulated Extraterrestrial Conditions. Origins of Life and Evolution of Biospheres, 39, 565. Onofri, S., R. de la Torre, J-P de Vera, et al. (2012) Survival of rock-colonizing organisms after 1.5 years in outer space." Astrobiology. 2012;12:508-516. Onofri, S., et al (2018). Survival, DNA, and Ultrastructural Integrity of a Cryptoendolithic Antarctic Fungus in Mars and Lunar Rock Analogues Exposed Outside the International Space. Astrobiology, 19, 2. Osman, S., Peeters, Z., La Duc, M.T., Mancinelli, R., Ehrenfreund, P., Venkateswaran, K., (2008). Effect of shadowing on survival of bacteria under conditions simulating the Martian atmosphere and UV radiation. Applied and Environmental Microbiology 74, 959-970. Pacelli, C., L. Selbmann, L. Zucconi, J. P. P. De Vera, E. Rabbow, G. Horneck, R. de la Torre, S. Onofri (2016) "BIOMEX experiment: Ultrastructural alterations, molecular damage and survival of the fungus Cryomyces antarcticus after the Experiment Verification Tests." (Origin of Life and Evolution of Biospheres 47(2):187-202. Perron, J. Taylor; Jerry X. Mitrovica; Michael Manga; Isamu Matsuyama & Mark A. Richards (2007). Evidence for an ancient Martian ocean in the topography of deformed shorelines Nature. 447: 840-843. Petersen, J. H. (2013). The Kingdom of Fungi. Princeton University Press. Platt, J. L., Spatafora, J.W. (2000). Evolutionary Relationships of Lichenized Fungi: Molecular Phylogenetic Hypotheses for Genera Siphula, Thamnolia from SSU and LSU rDNA. Mycologia. 92, 475-487. Puleo JR, Fields ND, Bergstrom SL, Oxborrow GS, Stabekis PD, Koukol R. (1977) Microbiological profiles of the Viking spacecraft. Appl Environ Microbiol. 33:379-384. Rabb, H. (2015) Life on Mars - Visual Investigation. https://www.scribd.com/doc/288486718/Life-on-Mars-Visual-Investigation. Scrib D. publishers. Rabb, H. (2018). Life on Mars, Astrobiology Society, SoCIA, University of Nevada, Reno, USA. April 14, 2018. Raggio J, Pintado A, Ascaso C, De La Torre R, De Los Ríos A, Wierzchos J, Horneck G, Sancho LG (2011). Whole lichen thalli survive exposure to space conditions: results of Lithopanspermia experiment with Aspicilia fruticulosa. Astrobiology. 2011 May;11(4):281-92. doi: 10.1089/ast.2010.0588. Rajendrana, K, Shampa, S. Sujac, S. Lakshmana S.T. VinothKumarc. V. (2017) Evaluation of cytotoxicity of hematite nanoparticles in bacteria and human cell lines, Colloids and Surfaces B: Biointerfaces Volume 157, 101-109. Randel, W. J. et al., (1998). Seasonal Cycles and QBO Variations in Stratospheric CH4 and H2O Observed in UARS HALOE Data. Journal of the Atmospheric Sciences, 55. 163-185. Rasmussen, R. A., Khalil, M.A.K. (1981). Atmospheric methane (CH4): Trends and seasonal cycles, JGR Oceans, 86, 9826-9832. Renno, N. O., and 22 colleagues (2009) Physical and Thermodynamical Evidence for Liquid Water on Mars, Lunar and Planetary Science Conference, Houston, March 23-27. Richardson, J.T.E. (2005). Instruments for obtaining student feedback: a review of the literature. Assessment & Evaluation in Higher Education 30, no. 4: 387-415. Rizzo, V., & Cantasano, N. (2009) Possible organosedimentary structures on Mars. International Journal of Astrobiology 8 (4): 267-280. Rizzo, V., & Cantasano, N. (2011), Cyanobacteria on Terrestrial Meteorites and Stromatolites on Mars, Journal of Cosmology, 13, 15. Rizzo, V. & Cantasano, N. (2016). 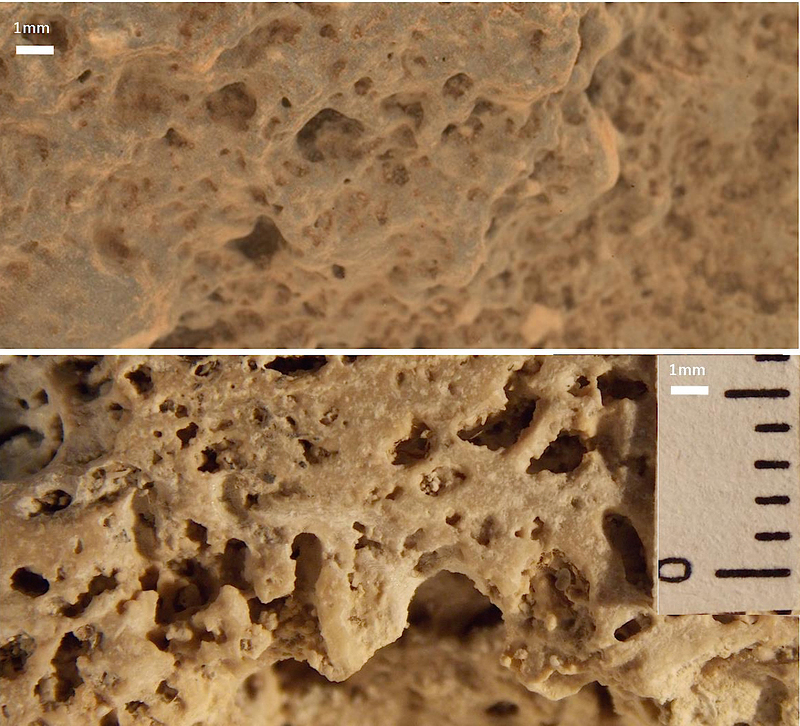 Structural parallels between terrestrial microbialites and Martian sediments. International Journal of Astrobiology, doi:10.1017/S1473550416000355 Robb, F., Antranikian, G., Grogan, D., Driessen, A. (2007). Thermophiles: Biology and Technology at High Temperatures, CRC Press. Roos‐Serote, M., Atreya, S. K., Webster, C. R. Mahaffy, P. R. (2016). Cometary origin of atmospheric methane variations on Mars unlikely. JGR Planets, 121, 2108-2119. Roberts, P., & Evans S. (2011). The book of Fungi. University of Chicago Press. Ryan, BD, Bungartz F, Nash TH (2002). Morphology and anatomy of the lichen thallus. In Lichen Flora of the greater Sonoran Desert region (eds Nash TH, Ryan BD, Gries C, Bungartz F), pp. 8-23. Tempe, AZ. Sanchez, F. J., E. et al. (2012) The resistance of the lichen Circinaria gyrosa (nom. provis.) towards simulated Mars conditions-a model test for the survival capacity of an eukaryotic extremophile." Planetary and Space Science, 2012, 72(1), 102-110. Sancho L. G., de la Torre, R., Horneck, G., Ascaso, C. , de los Rios, A. Pintado,A., Wierzchos, J.,Schuster, M. (2007). Lichens Survive in Space: Results from the 2005 LICHENS Experiment Astrobiology. 7, 443-454. Satoh, K, Y, Nishiyama, T. Yamazaki, T. Sugita, Y. Tsukii, K. Takatori, Y. Benno, and K. Makimura. "Microbe-I (2011) Fungal biota analyses of the Japanese experimental module KIBO of the International Space Station before launch and after being in orbit for about 460 days." Microbiol Immunol. 2011 Dec;55(12):823-9. doi: 10.1111/j.1348-0421.2011.00386.x. Schulze‐Makuch, D. et al. (2005) Scenarios for the evolution of life on Mars, Journal of Geophysical Research: Planets, 110, E12. Schroder, K-P, Smith, R. C. (2008). Distant future of the Sun and Earth revisited. Mon. Not. R. Astron. Soc. 000, 1-10. Setlow, P. (2006). Spores of Bacillus subtilis: their resistance to and killing by radiation, heat and chemicals. Journal of Applied Microbiology 101, 514-525. Setlow, B., Setlow, P. (1995). Small, acid-soluble proteins bound to DNA protect Bacillus subtilis spores from killing by dry heat. Appl Environ Microbiol. 61, 2787-2790. Schuerger, A. C., Ming, D. W., Golden, D.C. (2017). Biotoxicity of Mars soils: 2. Survival of Bacillus subtilisand Enterococcus faecalis in aqueous extracts derived from six Mars analog soils, Icarus 290, 215-223. Seminara, A. et al (2018). A universal growth limit for circular lichens. Journal of the Royal Society Interface, June 6. Shaheen, R. Et al. (2015). Carbonate formation events in ALH 84001 trace the evolution of the Martian atmosphere, PNAS, 112 (2) 336-341. Squyres, S. W. and 18 colleagues (2004) In Situ Evidence for an Ancient Aqueous Environment at Meridiani Planum, Mars, Science 306 (5702), 1709-1714. 2004 Dec 03. Soffen, G.A. (1965). NASA Technical Report, N65-23980. Steele, A., McCubbin, F.M., Fries, M. (2012). A Reduced Organic Carbon Component in Martian Basalts, Science, 337, 212-215. Sutter, B., Eigenbrode, J. L., Steele, A., McAdam, A., Ming, D. W., Archer, D., Jr., Mahaffy, P. R. (2016). The Sample Analysis at Mars (SAM) Detections of CO2 and CO in Sedimentary Material from Gale Crater, Mars: Implications for the Presence of Organic Carbon and Microbial Habitability on Mars. American Geophysical Union, Fall General Assembly 2016, abstract id.P21D-07. Szewczyk, N.J., Mancinelli, R.L., McLamb, W., Reed, D., Blumberg, B.S., Conley, C.A., (2005). Caenorhabditis elegans survives atmospheric breakup of STS-107, Space Shuttle Columbia. Astrobiology 5, 690-705. Tehler, A. & Wedin, M. (2008). Systematics of Lichenized Fungi. In Nash, T. H. (editor) Lichen Biology, Cambridge University Press. Thomas-Keprta K.L et al. (2002) "Magnetofossils from Ancient Mars: A Robust Biosignature in the Martian Meteorite ALH84001." Applied and Environmental Microbiology 68, 3663-3672. Thomas-Keprta, K. L., et al., (2009). Origins of magnetite nanocrystals in Martian meteorite ALH84001. Geochimica et Cosmochimica Acta, 73, 6631-6677. Treiman A.H. (2003) The Nakhla martian meteorite is a cumulate igneous rock: Comment on Varela et al. (2001). Mineralogy and Petrology 77 , 271-277. Treiman, A. H., & Essen, E. J. (2011). Chemical composition of magnetite in Martian meteorite ALH 84001: Revised appraisal from thermochemistry of phases in Fe-Mg-C-O. Geochimica et Cosmochimica Acta, 75, 5324-5335. Tugay, T. Zhdanova, N.N., Zheltonozhsky, V., Sadovnikov, L., Dighton, J. (2006). The influence of ionizing radiation on spore germination and emergent hyphal growth response reactions of microfungi, Mycologia, 98(4), 521-527. U.S. Department of the Interior (2010) Lichen Inventory Synthesis Western Arctic National Parklands and Arctic Network, Alaska. Natural Resource Technical Report NPS/AKR/ARCN/NRTR--2010/385. Vaishampayan P, Rabbow E, Horneck G, Venkateswaran K .(2012) Survival of Bacillus pumilus spores for a prolonged period of time in real space conditions. Astrobiology. 2012;12:487-497. Van Den Bergh, S., (1989) Life and Death in the Inner Solar System, Publications of the Astronomical Society of the Pacific, 101, 500-509. Vanneste, M., et al. (2001). "Multi-frequency seismic study of gas hydrate-bearing sediments in Lake Baikal, Siberia". Marine Geology. 172: 1-21. Venkateswaran, K., M. T. La Duc, and MT Vaishampay (2012) Genetic Inventory Task: Final Report," JPL Publication 12-12. California Institute of Technology; Pasadena. Vesper, S.J., W. Wong, C.M. Kuo and D.L. Pierson. (2008) Mold species in dust from the ISS identified and quantified by mold-specific quantitative PCR. Research in Microbiology. 159: 432-435. Villanueva, G. Mumma, M. Novak, R. Kufl, H. Hartogh, P., Encrenaz, T., Tokunaga, A., Khayat, A., Smith, M. (2015) Strong water isotopic anomalies in the Martian atmosphere: Probing current and ancient reservoirs". Science. 348: 218-21. Wainwright, M., Fawaz Alshammari, F., Alabri, K. (2010). Are microbes currently arriving to Earth from space? 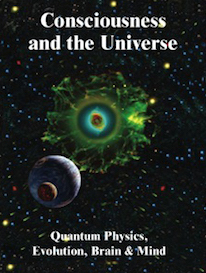 Journal of Cosmology, 2010, Vol 7, 1692-1702. Watt, S., C. Simpson, C. McKillop, and V. Nunn. (2002). Electronic course surveys: does automating feedback and reporting give better results? Assessment & Evaluation in Higher Education 27, no. 4: 325-337. Webster, C. R., et al. (2013) Isotope ratios of H, C, and O in CO2 and H2O of the Martian atmosphere. Science 341, 260-263. Webster, C. R. et al. (2015) Mars methane detection and variability at Gale crater, Science, 347, 415-417. Webster, C.R. et al. (2018). Background levels of methane in Mars' atmosphere show strong seasonal variations Science 360,1093-1096. Wember, V. V., Zhdanova, N. N. (2001) Peculiarities of linear growth of the melanin-containing fungi Cladosporium sphaerospermum Penz. and Alternaria alternata (Fr.) Keissler. Mikrobiol. Z. 63: 3-12. Whalen, S.C. (2005). Biogeochemistry of Methane Exchange between Natural Wetlands and the Atmosphere, Environmental and Atmospheric Science, 22, 1093-1096. White, O. et al. (1999) Genome Sequence of the Radioresistant Bacterium Deinococcus radiodurans R1, Science, 286, 1571-1577. Zakharova,K., et al. (2014). Protein patterns of black fungi under simulated Mars-like conditions. Scientific Reports, 4, 5114. Zhdanova NN, Lashko TN, Vasiliveskaya AI, Bosisyuk LG, Sinyavskaya OI, Gavrilyuk VI, Muzalev PN. (1991). Interaction of soil micromycetes with 'hot' particles in the model system. Microbiol J 53:9-17. Zhdanova, N. N., T. Tugay, J. Dighton, V. Zheltonozhsky and P McDermott, (2004) Ionizing radiation attracts soil fungi." Mycol Res. 2004, 108: 1089-1096. Zhuravskaya AN, Kershengoltz BM, Kuriluk TT, Shcherbakova TT. (1995). Enzymological mechanisms of plant adaptation to the conditions of higher natural radiation background. Rad Biol Radioecol 35:249-355.